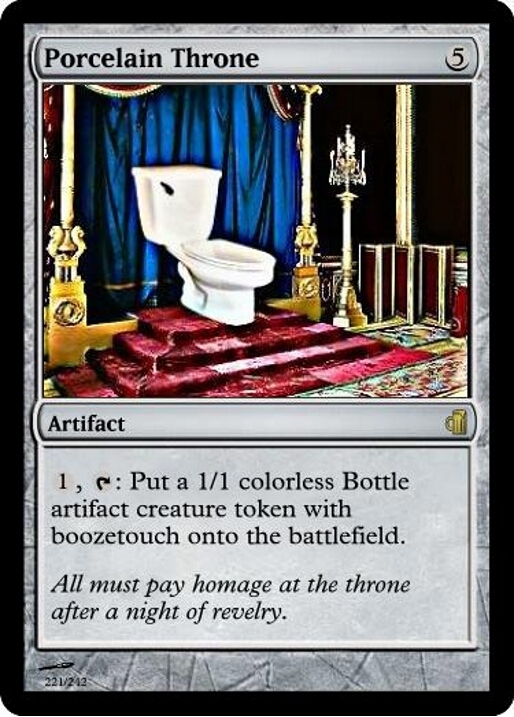 Seriously I would pay for a set. MILWAUKEES BEAST! 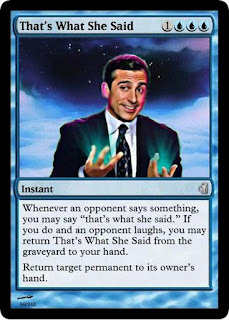 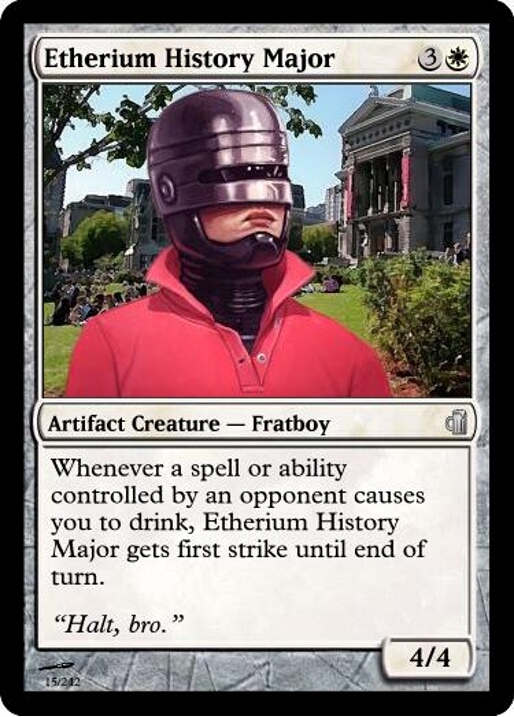 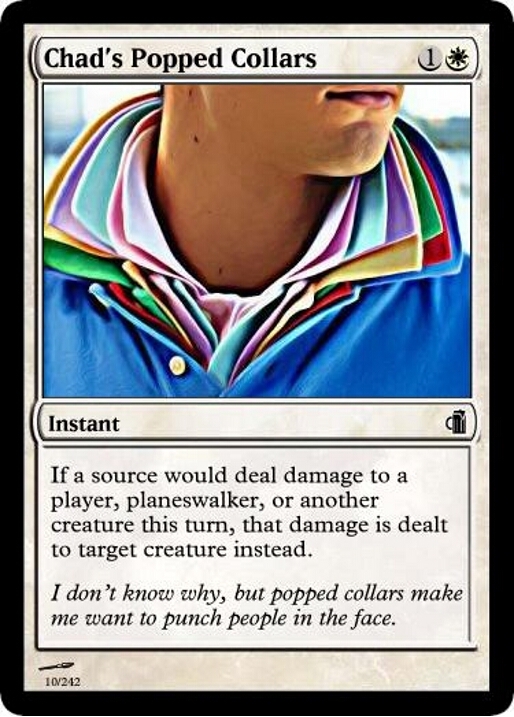 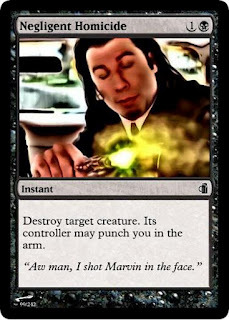 download the jpg files (all of the cards) and then print them out. 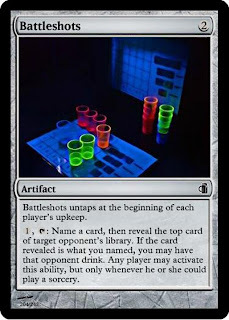 Add two extra sheets of paper to the back to make them thicker, put some kind of back cover as the top sheet (best would be to print out enough backs to cover all the cards because if you draw on the backs, you'll know which is which), laminate all of them, and then do some test-playing. 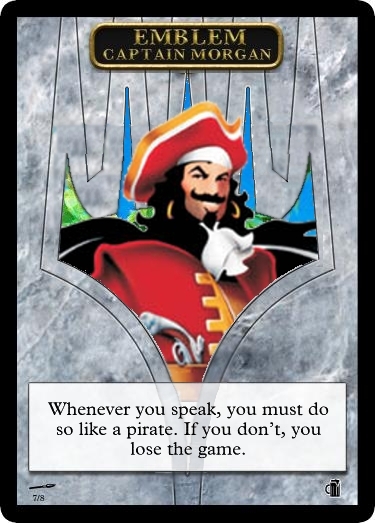 If it doesn't work, complain and go find a place that can print legit cards and pay them for the printing and lamination. 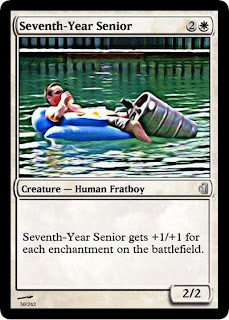 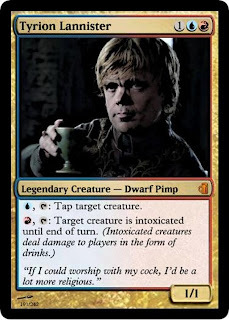 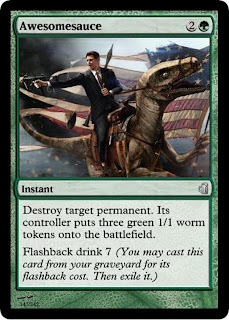 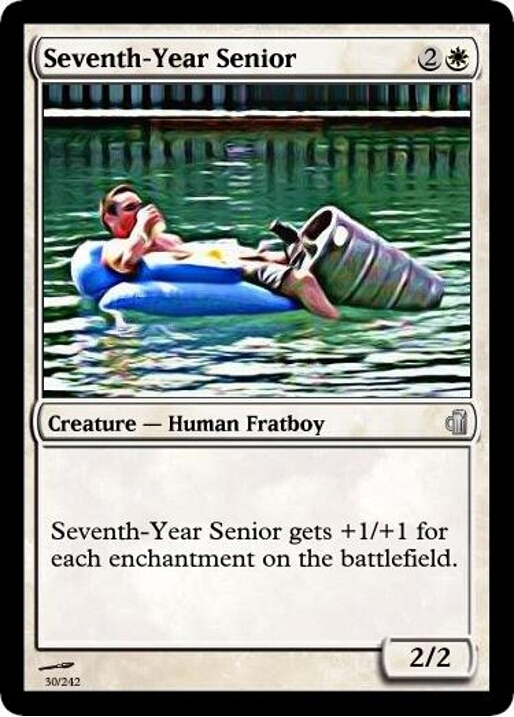 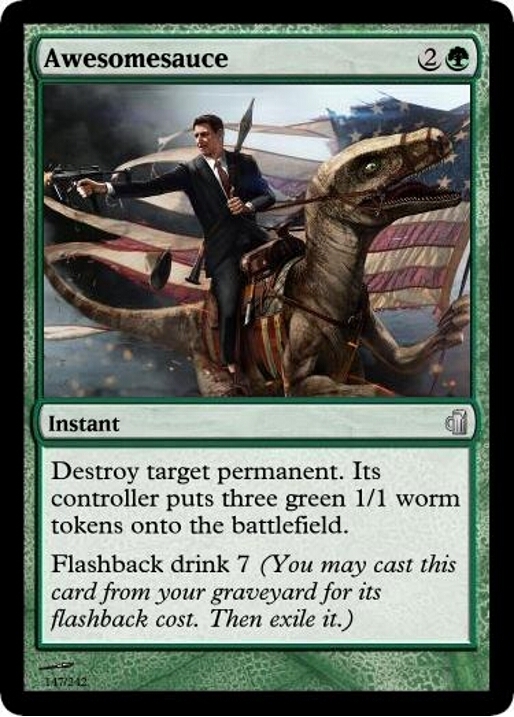 I would also pay for this. 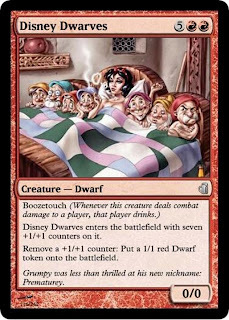 Even just the print sheets!! 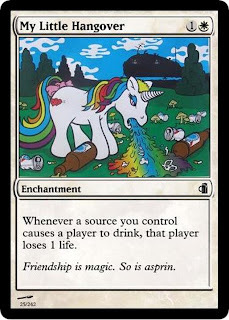 Could you upload bigger art pictures tomewhere or link to artist(s)? 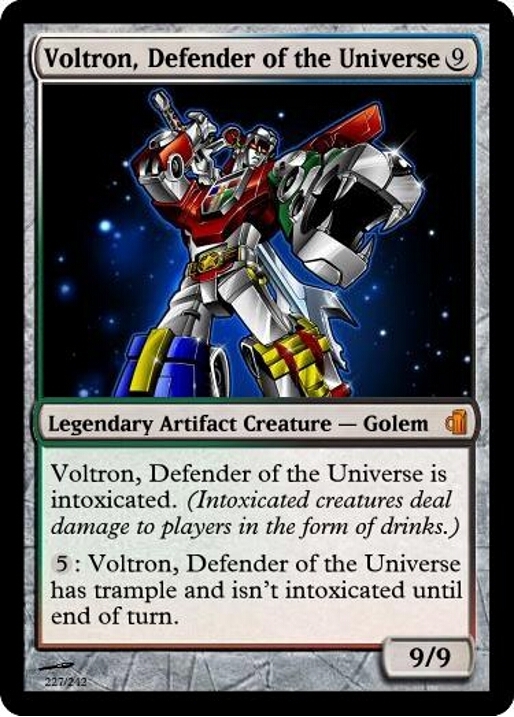 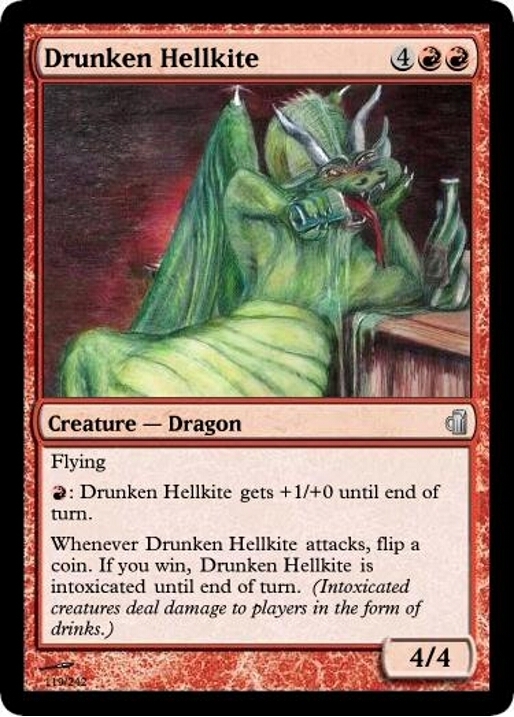 I'd love to see bigger pictures of these cards arts. 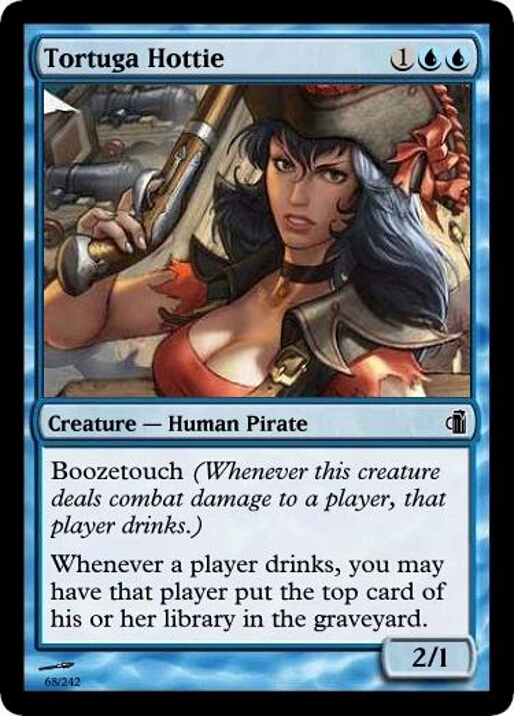 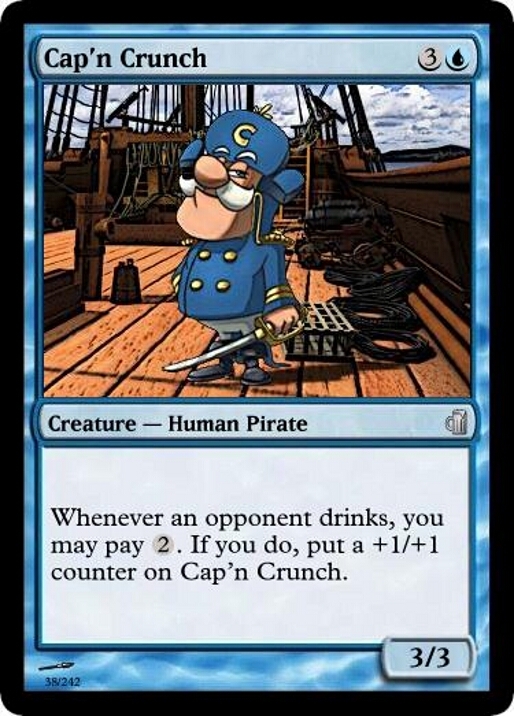 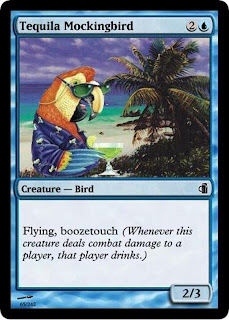 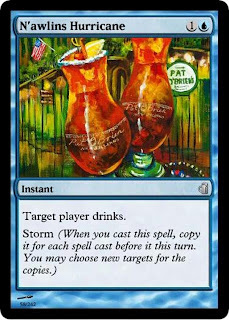 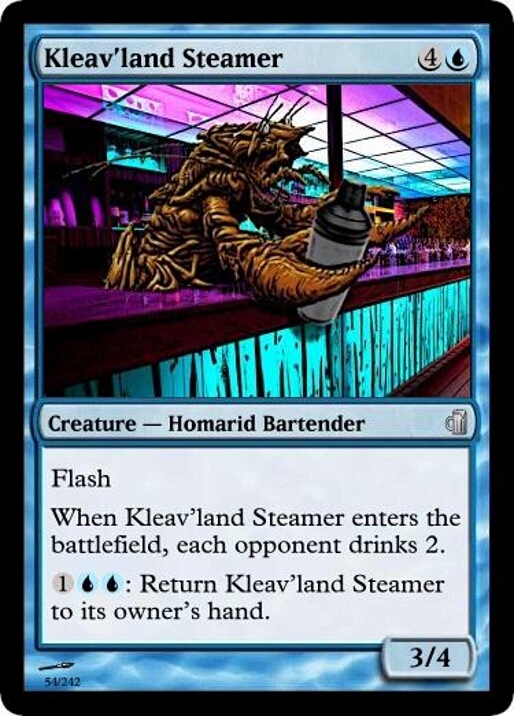 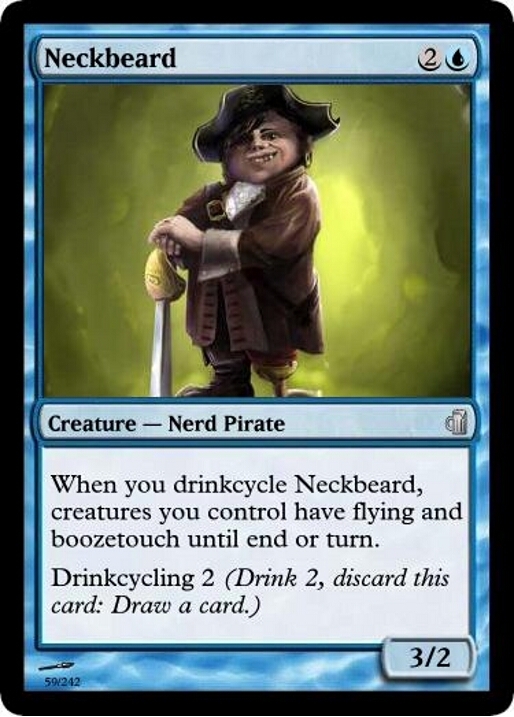 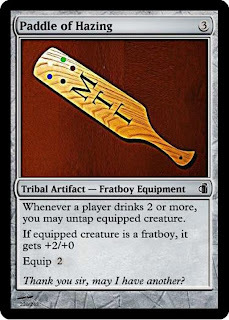 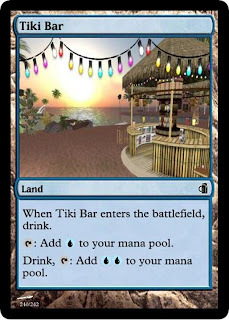 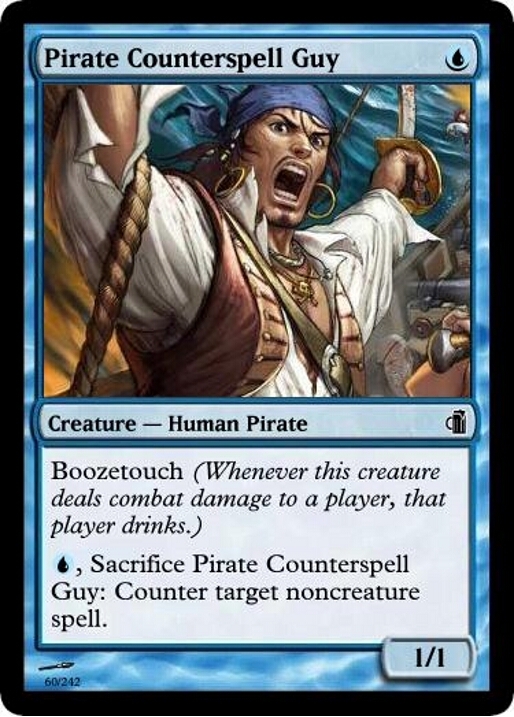 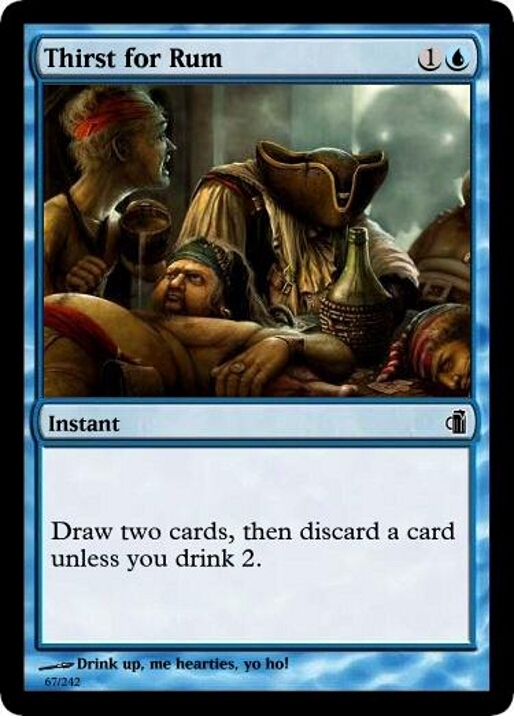 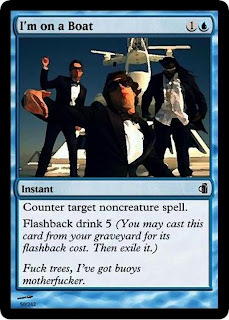 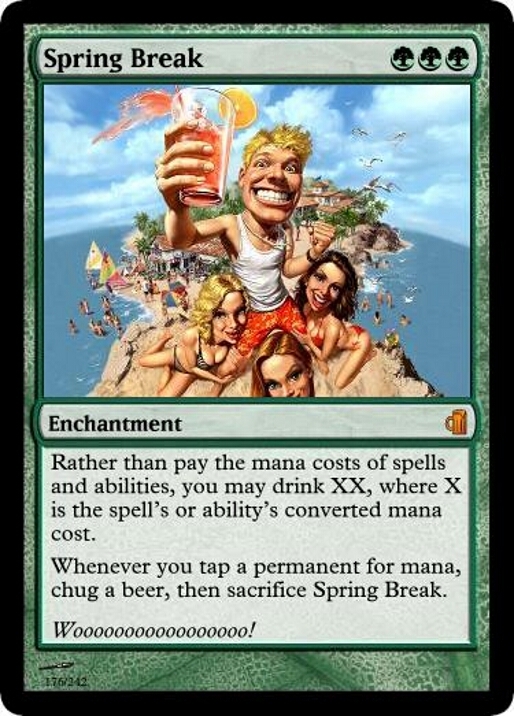 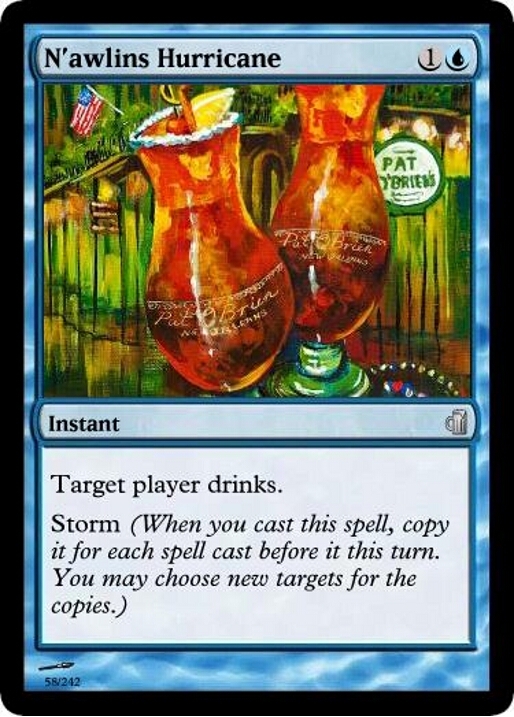 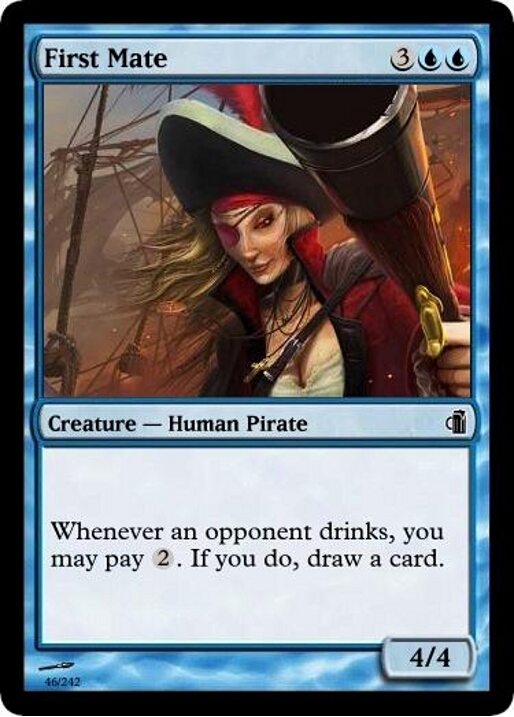 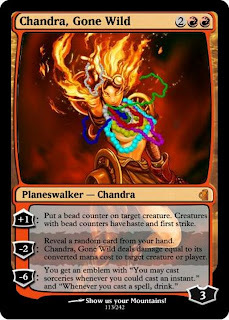 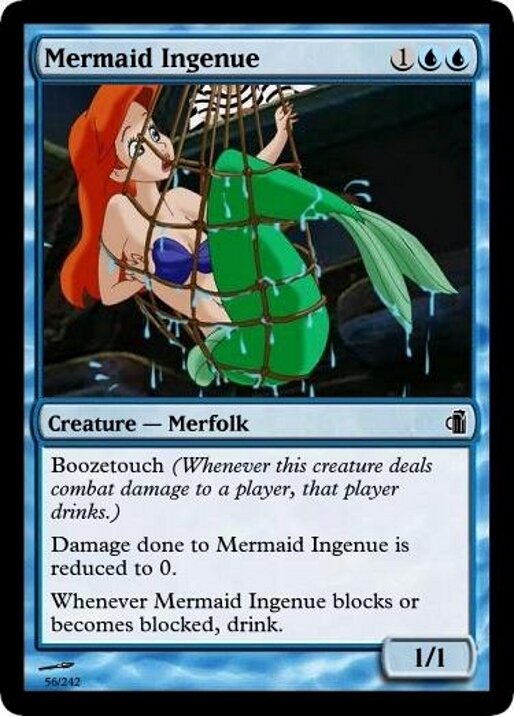 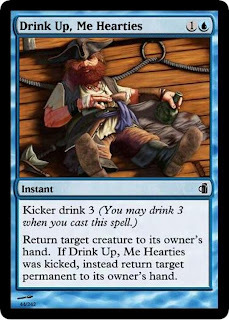 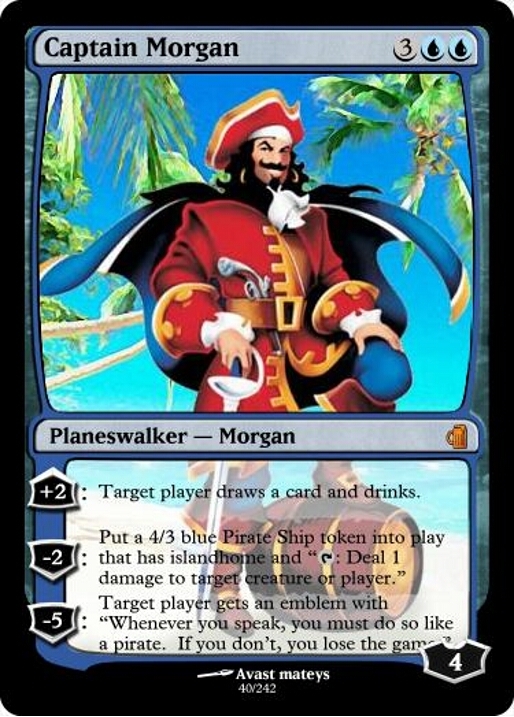 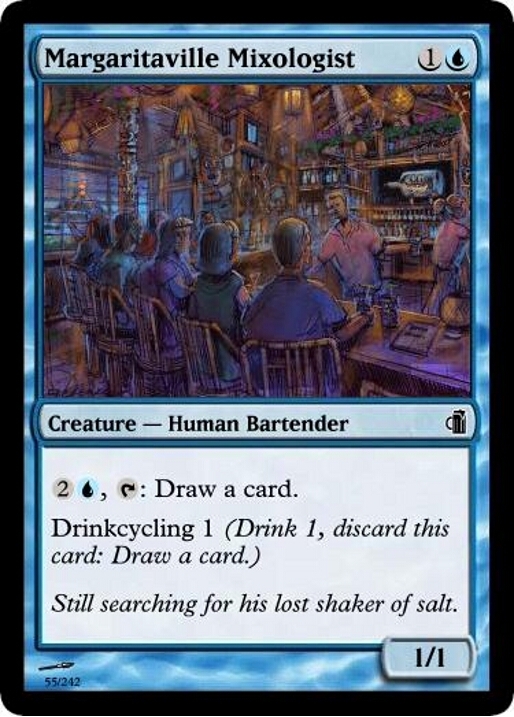 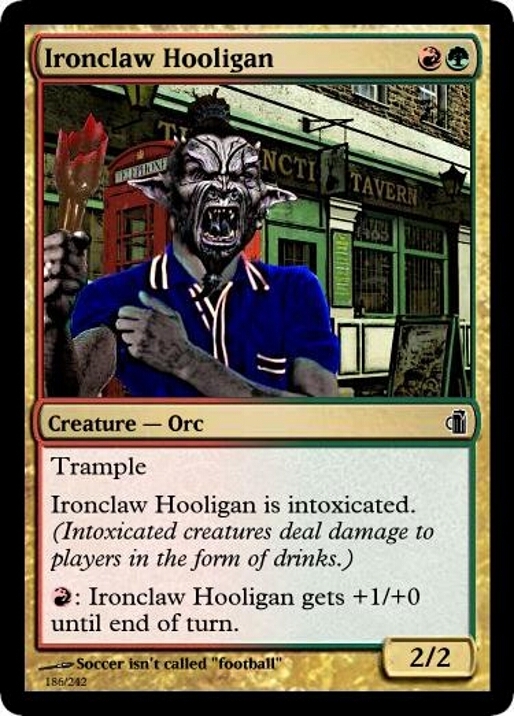 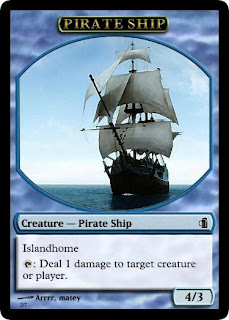 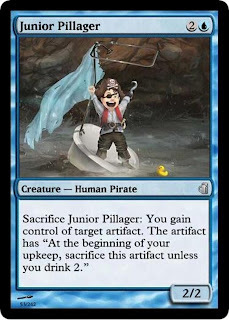 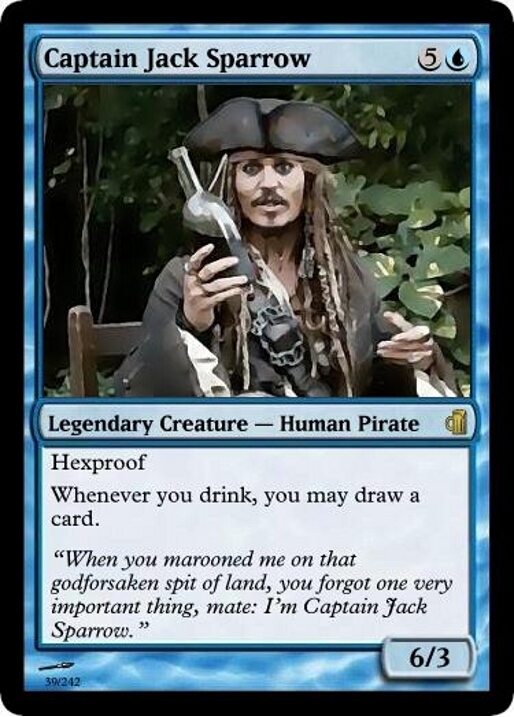 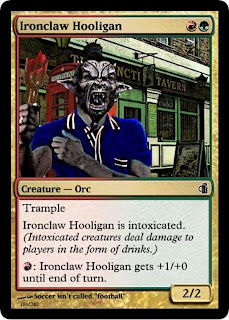 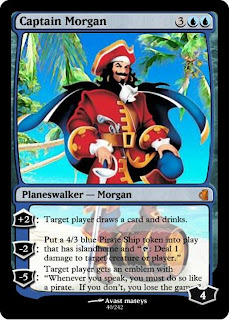 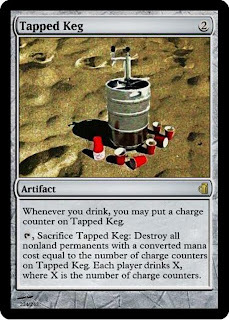 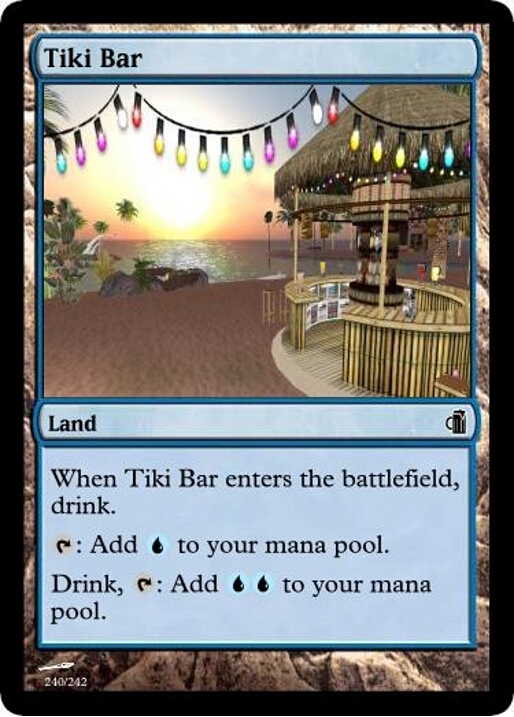 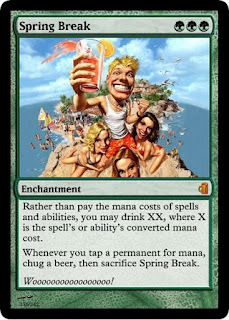 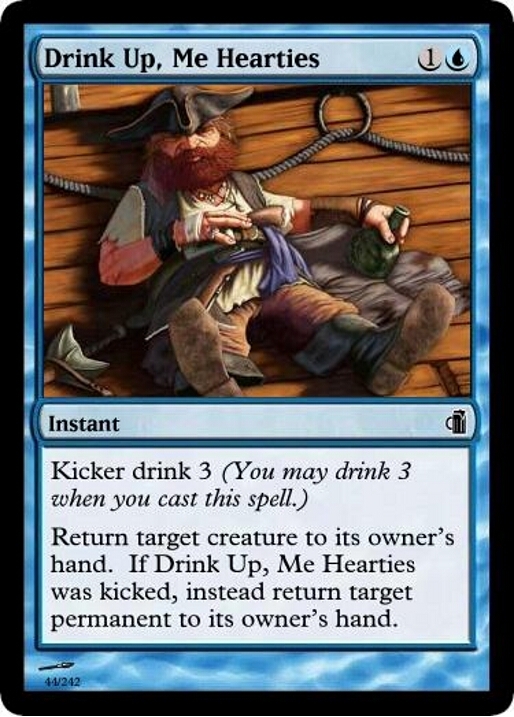 I cannot figure out what card created the islandhome Pirate Ship tokens. Is it an obsolete token from an earlier version? 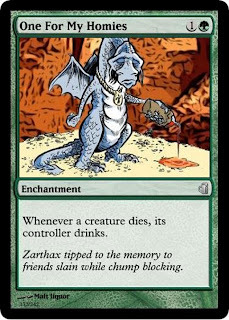 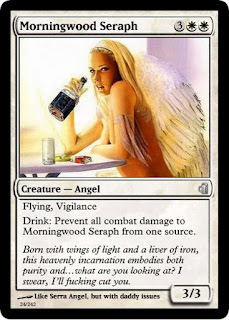 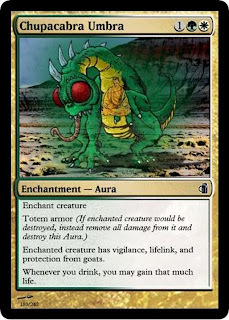 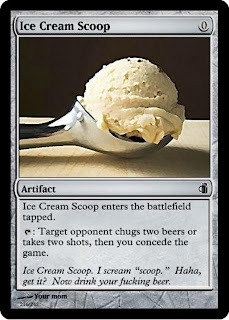 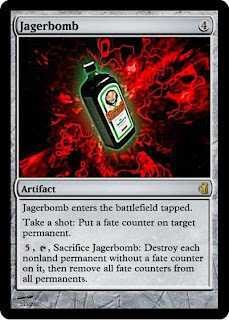 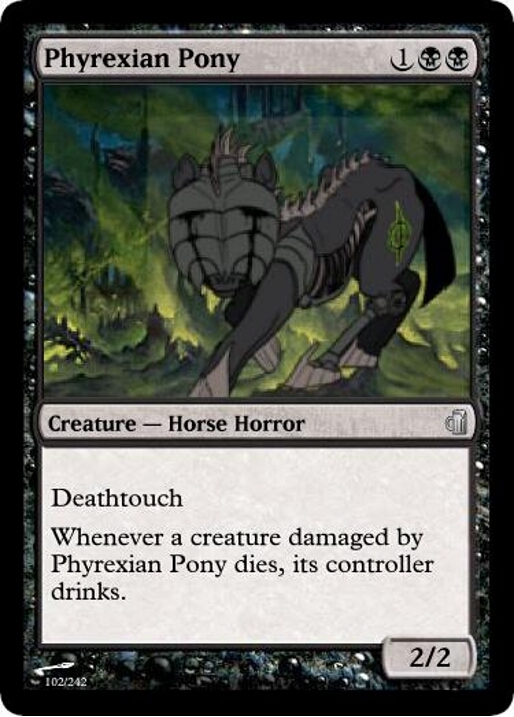 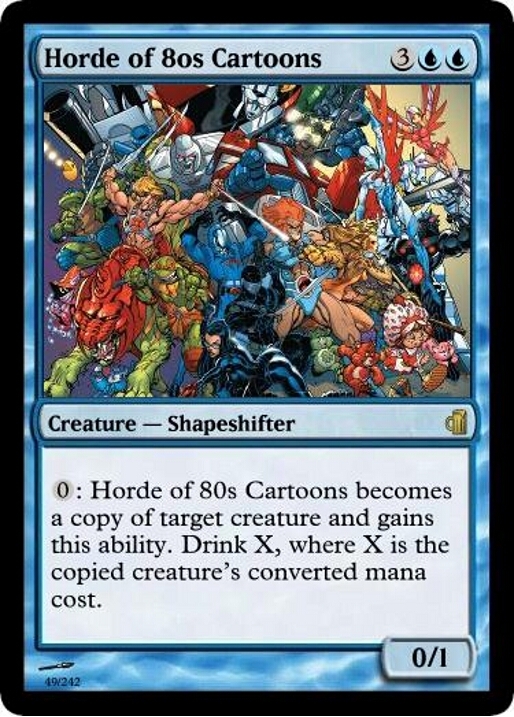 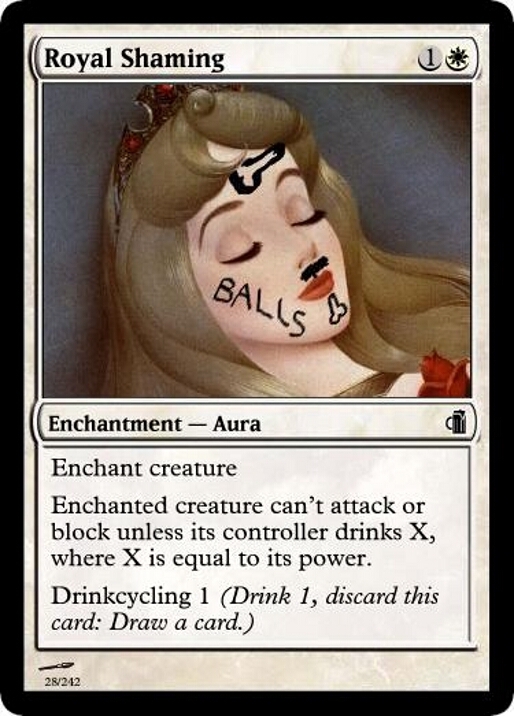 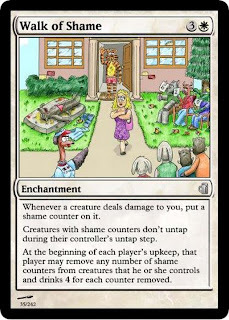 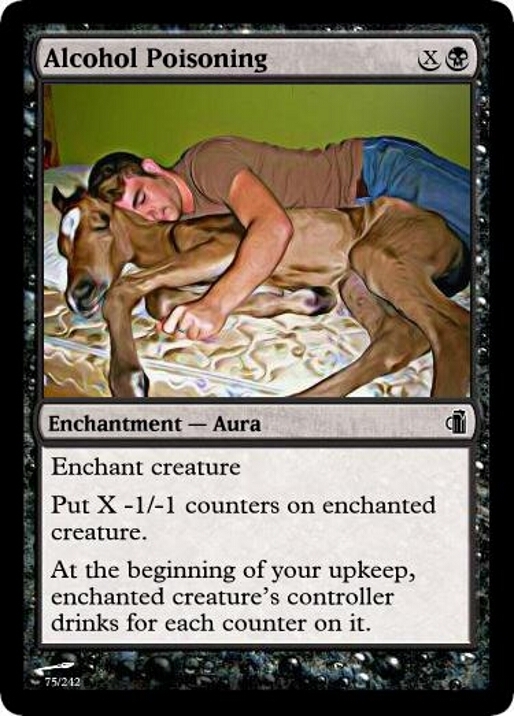 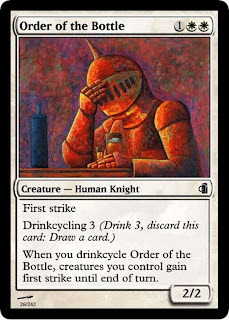 It's a keyword that WotC apparently got rid of, as I just found out when I was looking for a Comp Rules cite. 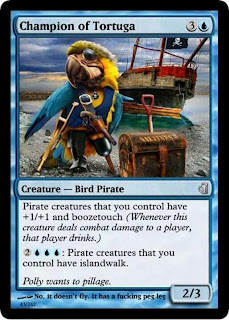 It meant that the creature couldn't attack unless the defending player had an island and that you had to sac it if you didn't have any. 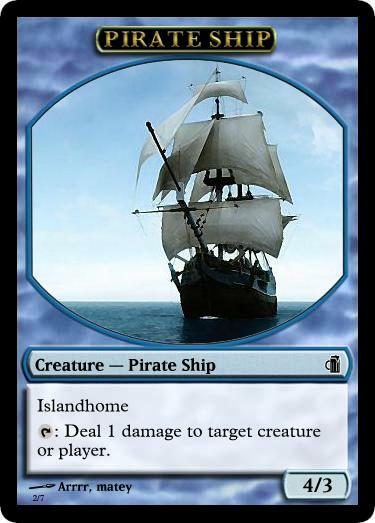 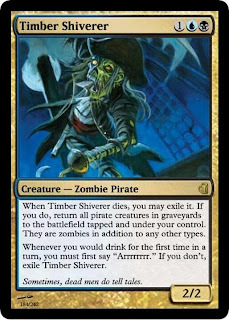 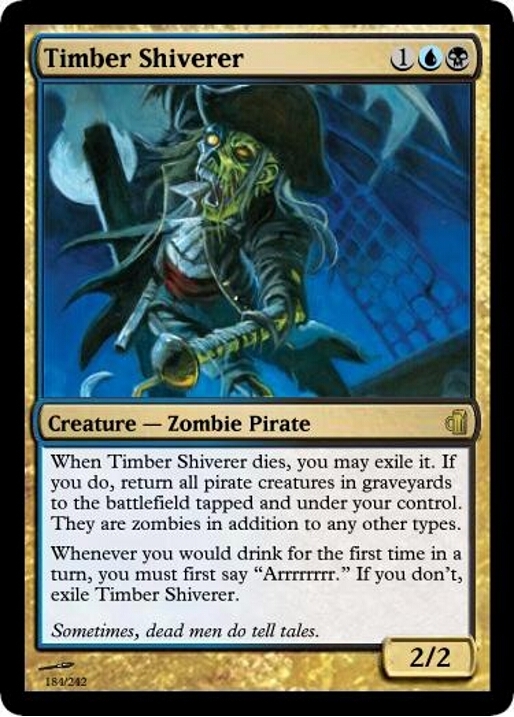 Check out the original Pirate Ship on Gatherer if you're curious why the token is how it is. Looks great! 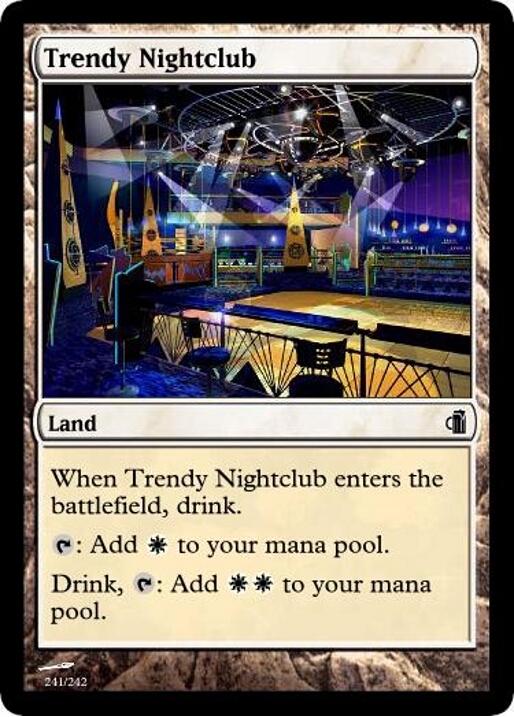 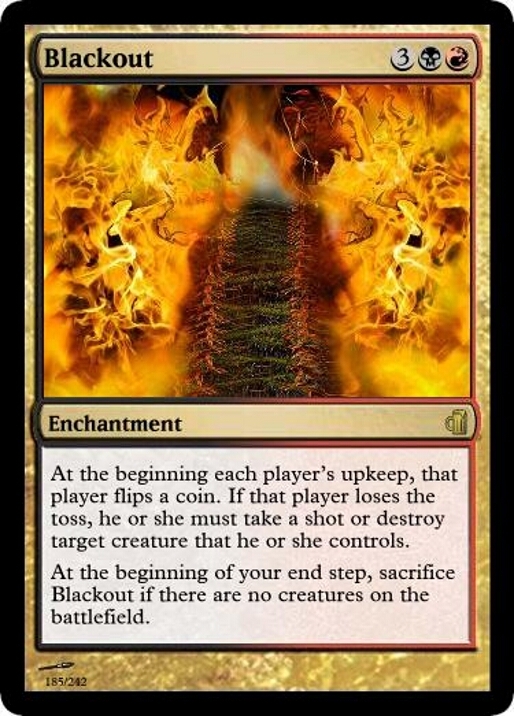 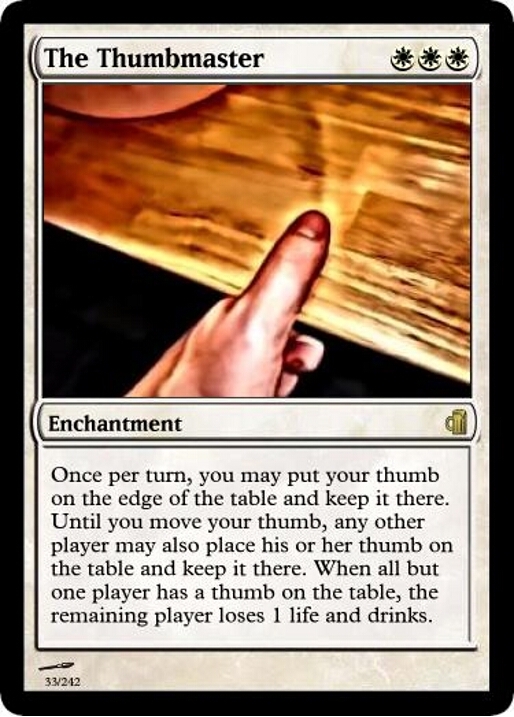 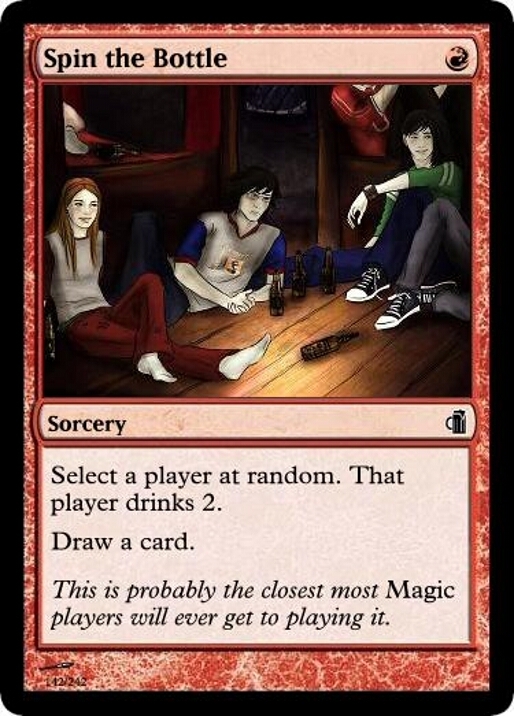 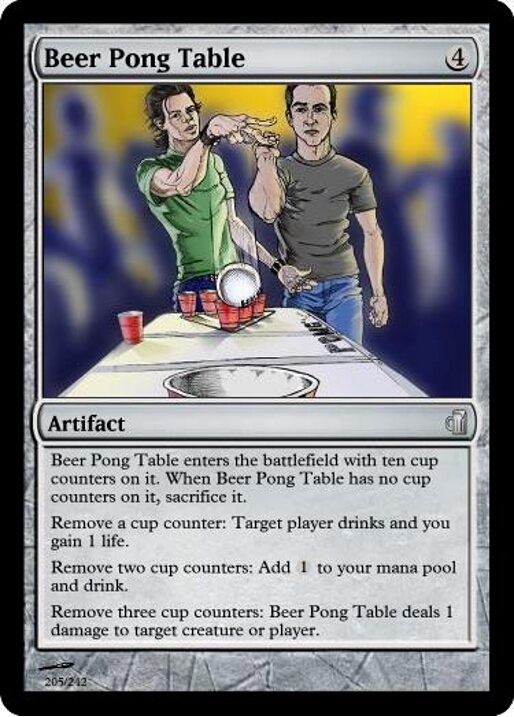 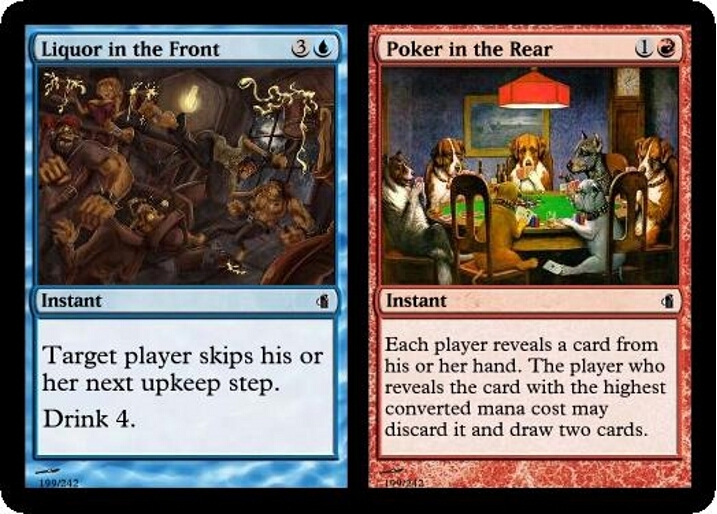 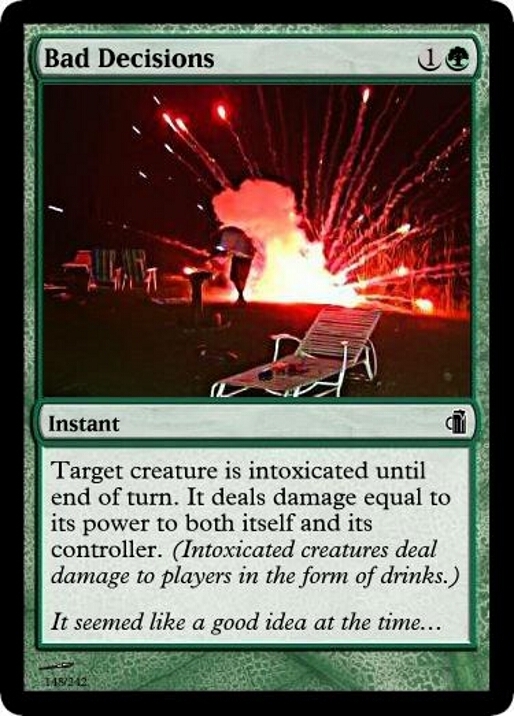 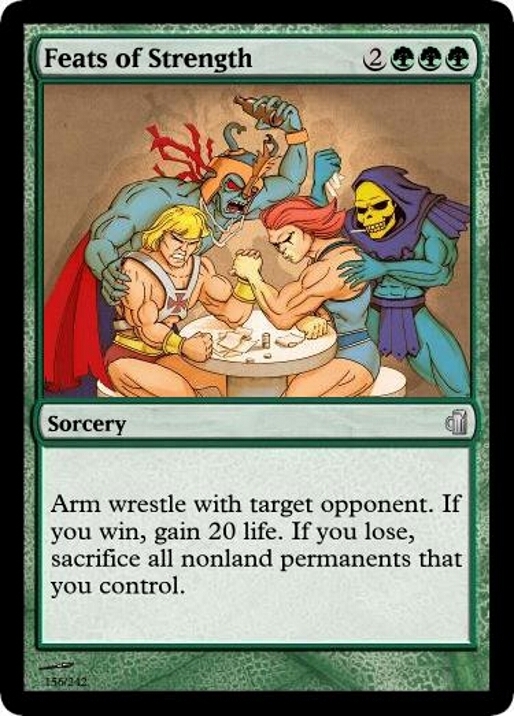 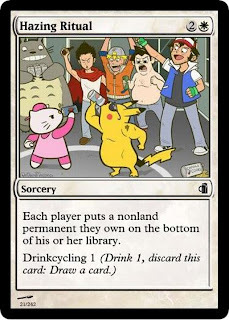 After a quick glance of the cards this looks really fun! 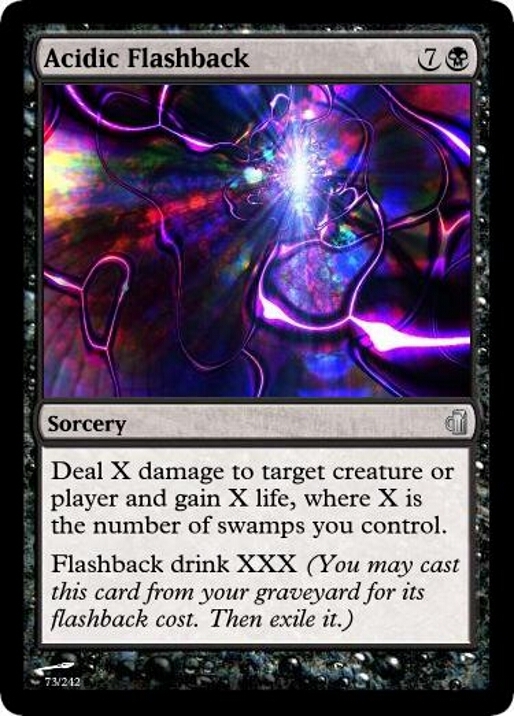 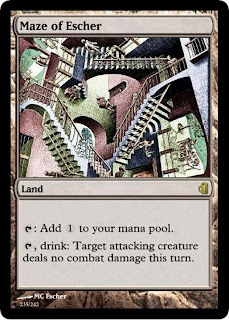 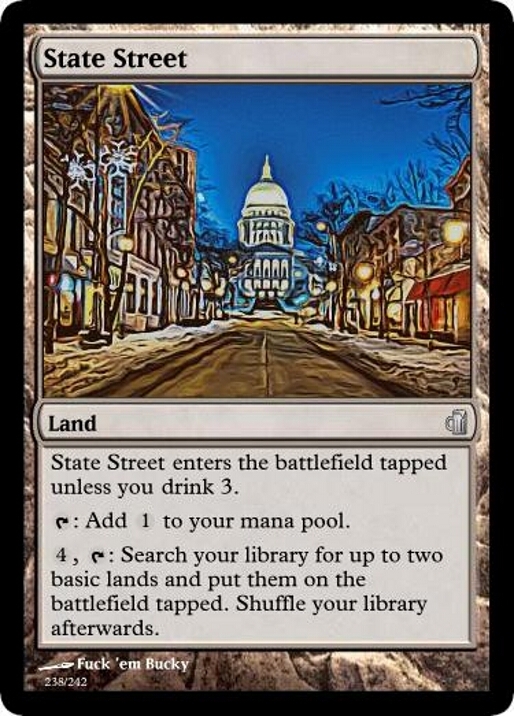 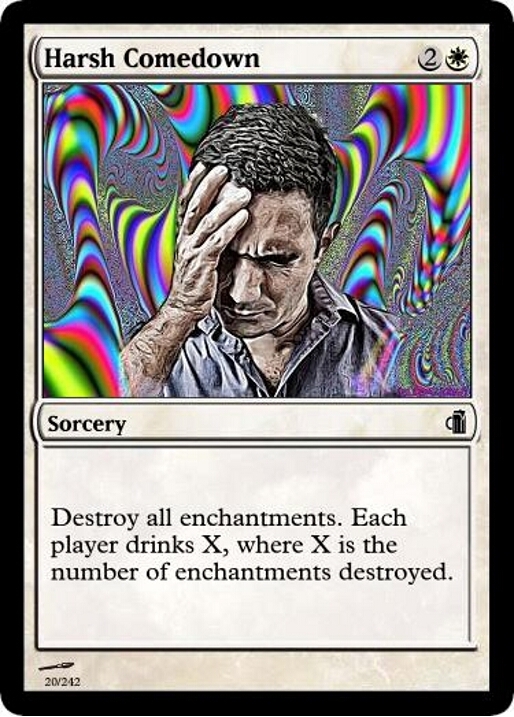 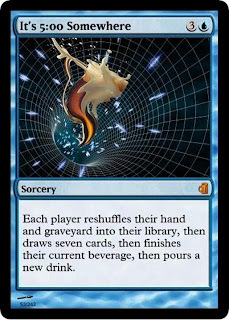 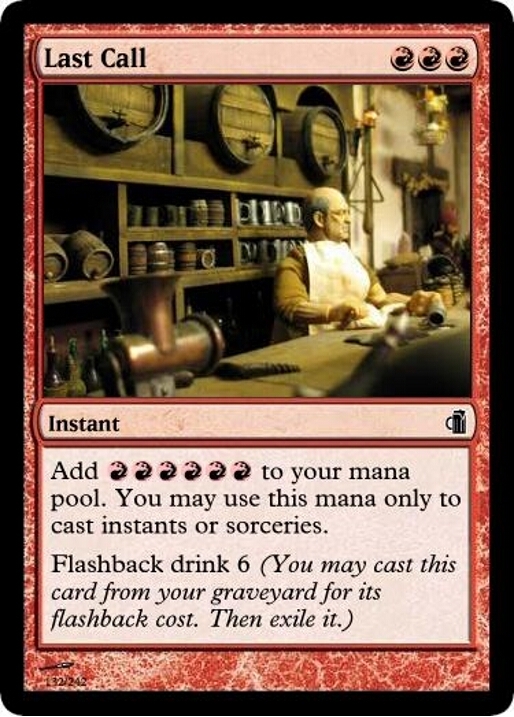 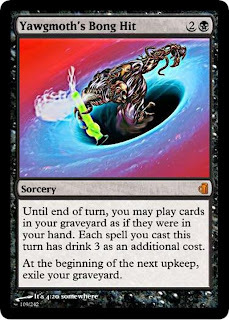 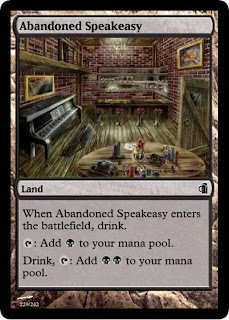 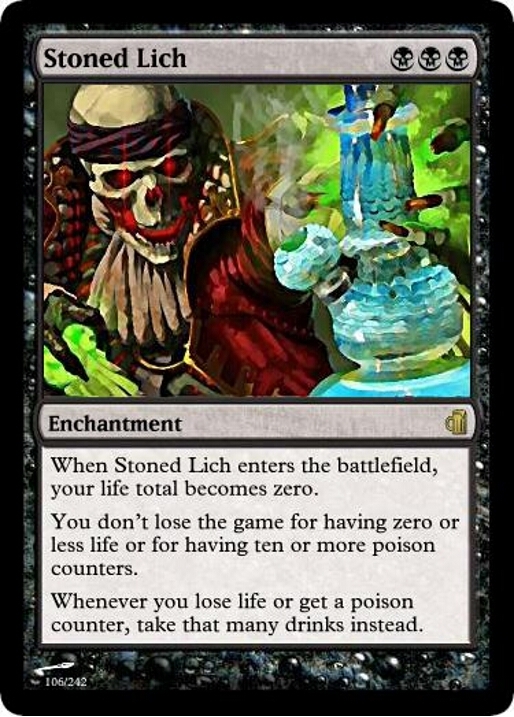 The only thing I noticed that might need to be changed is that Maze of Escher has a lowercase drink on it when it should be capitalized. 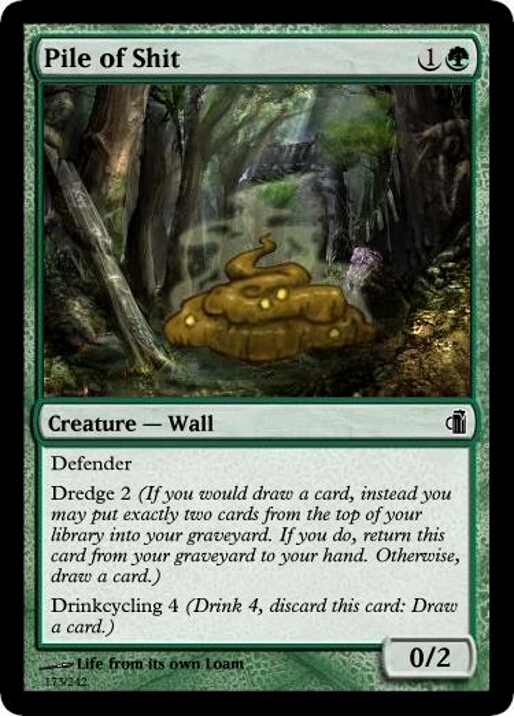 This looks well-executed, nice job! 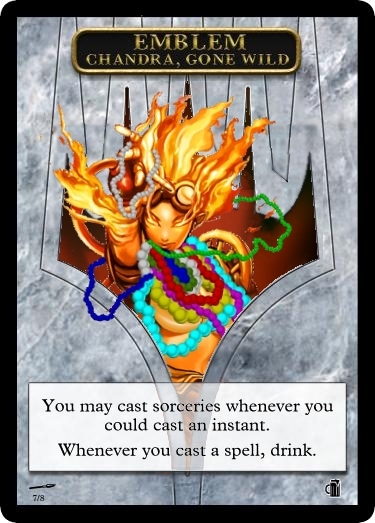 For those of you that want to download it and print it etc, there's a link at the top that says "Download Print Sheets", there is a ZIP with more printer-friendly versions of the cards. 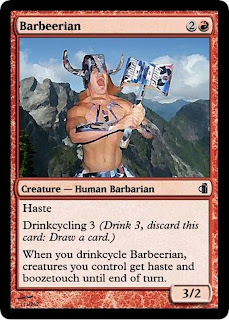 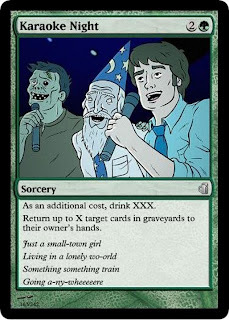 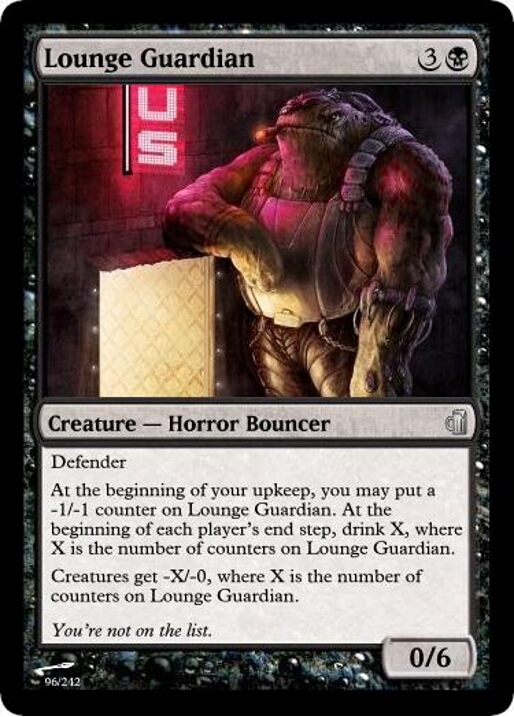 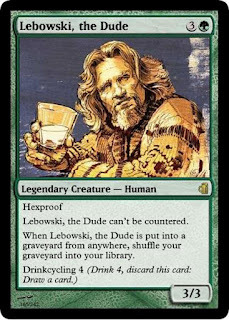 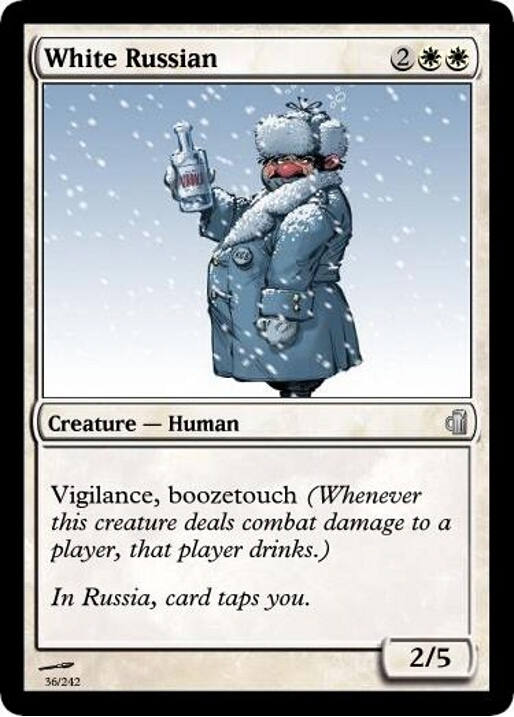 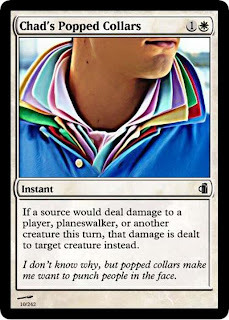 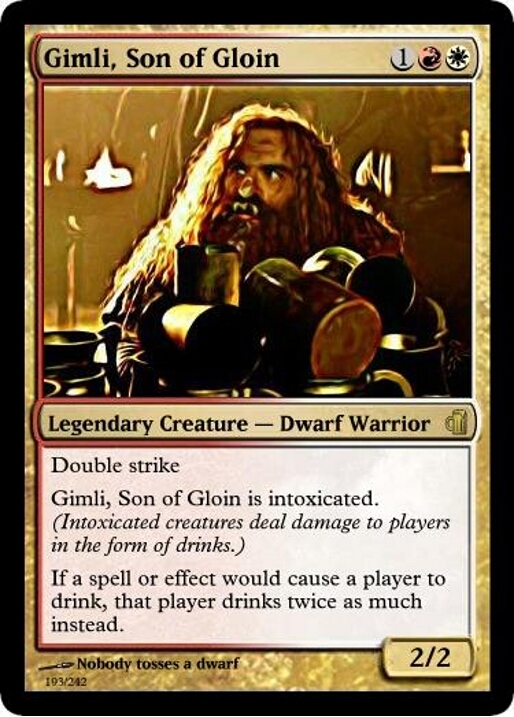 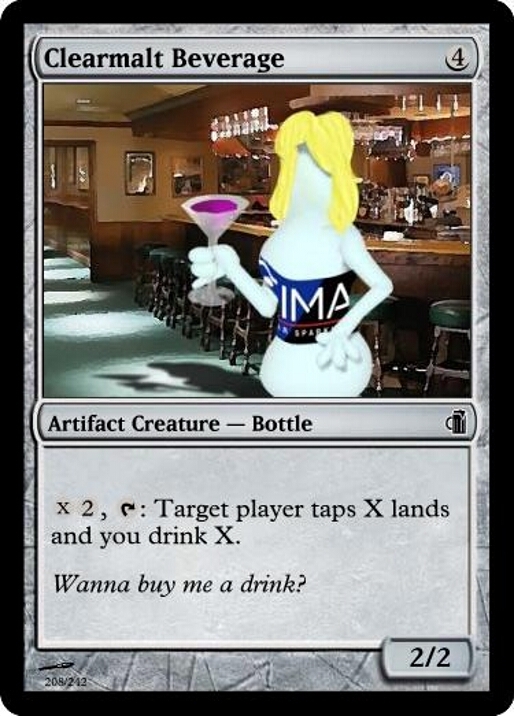 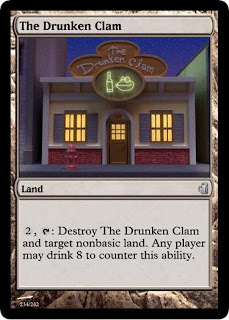 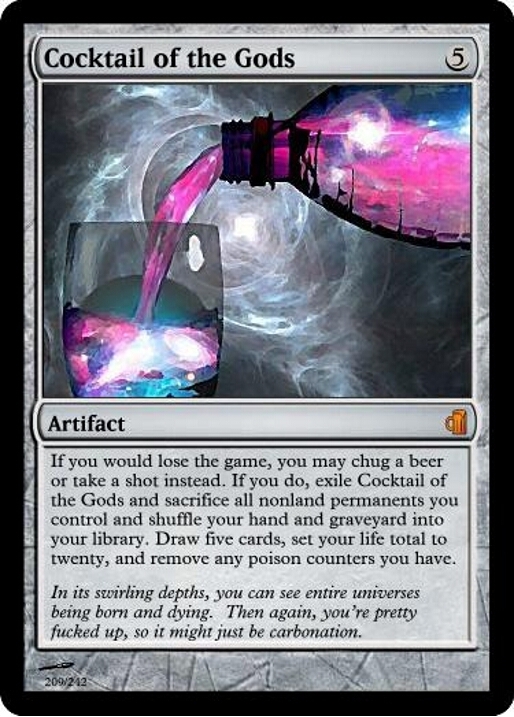 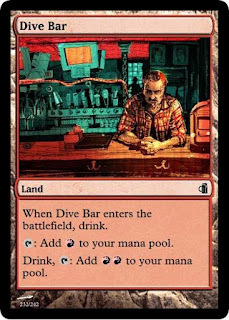 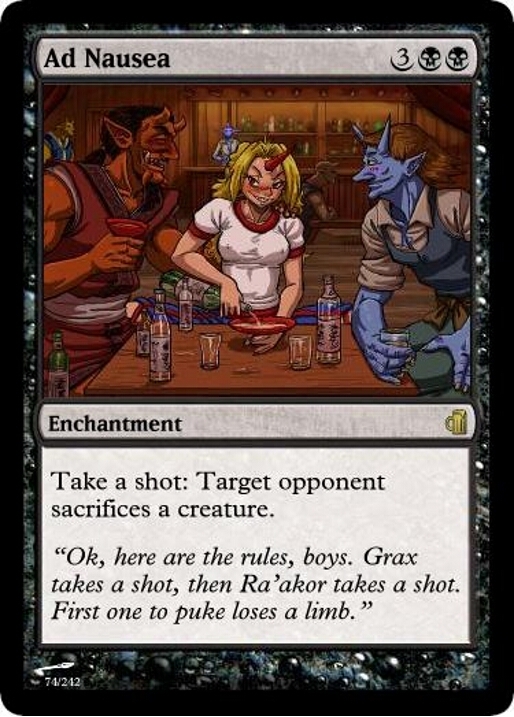 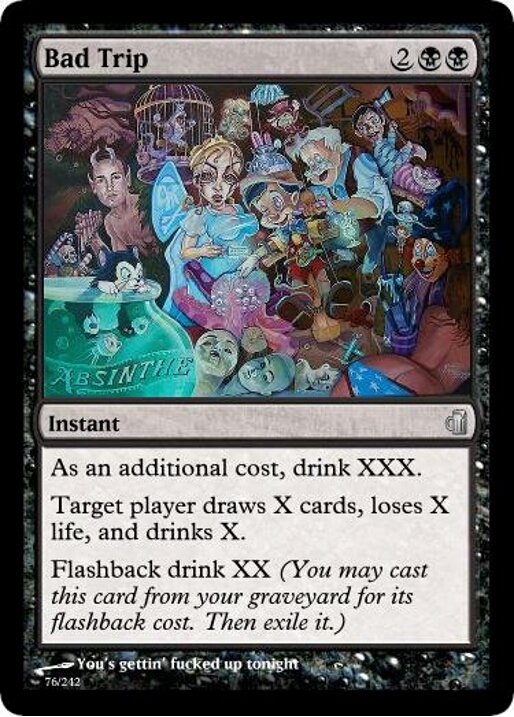 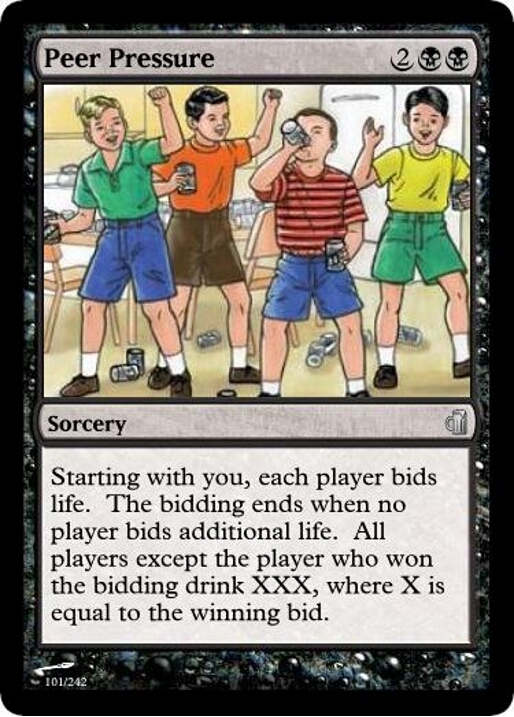 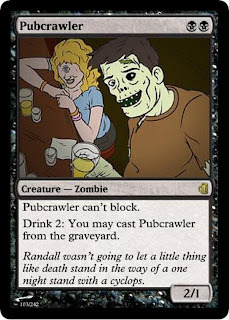 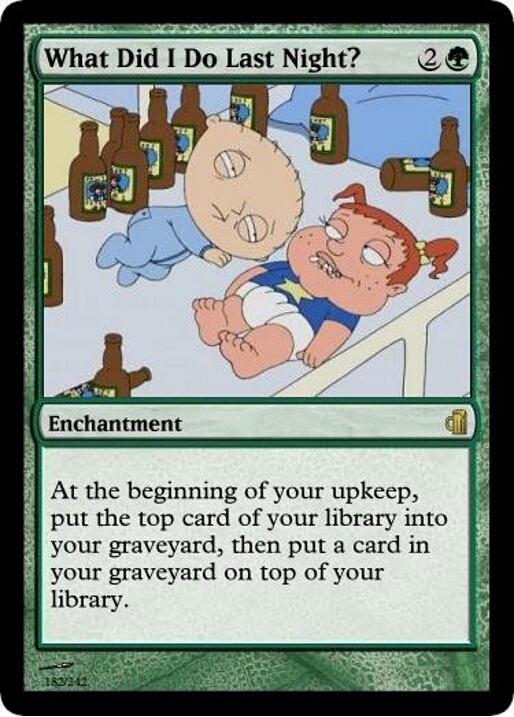 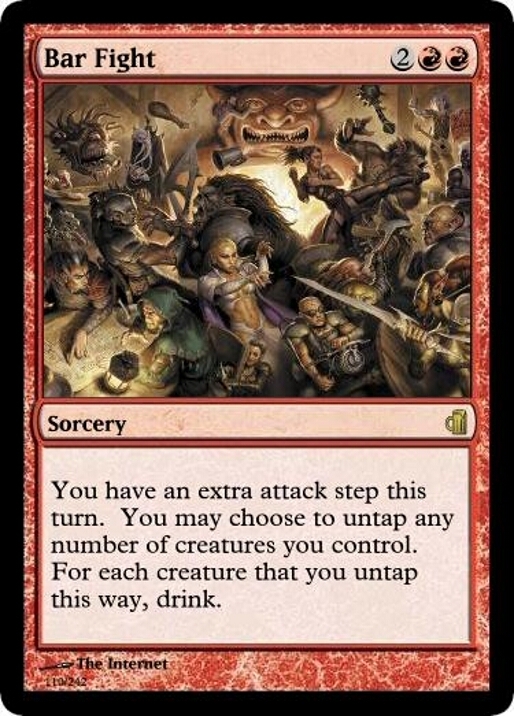 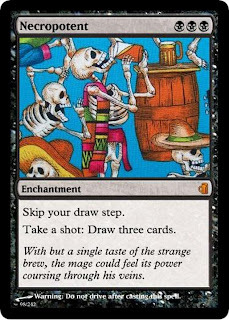 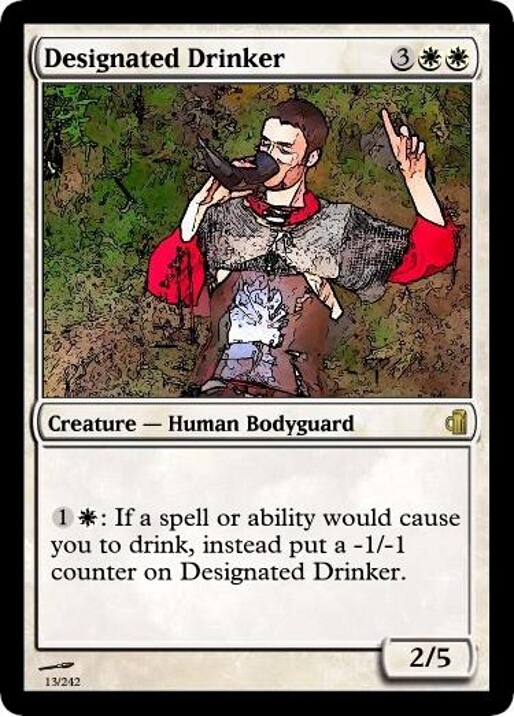 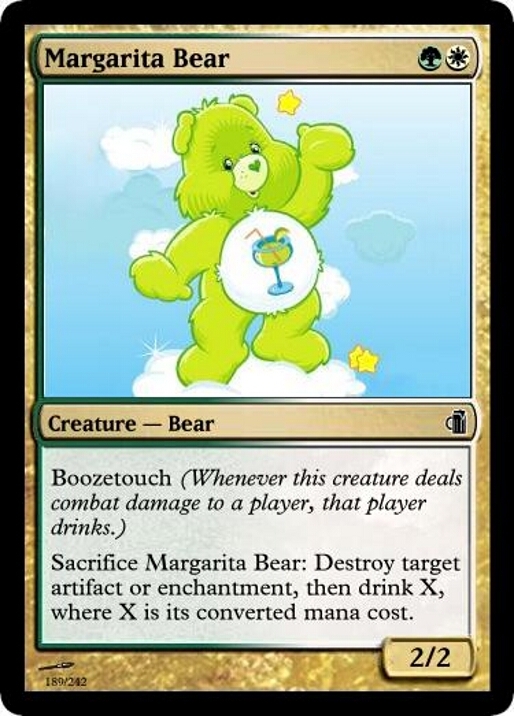 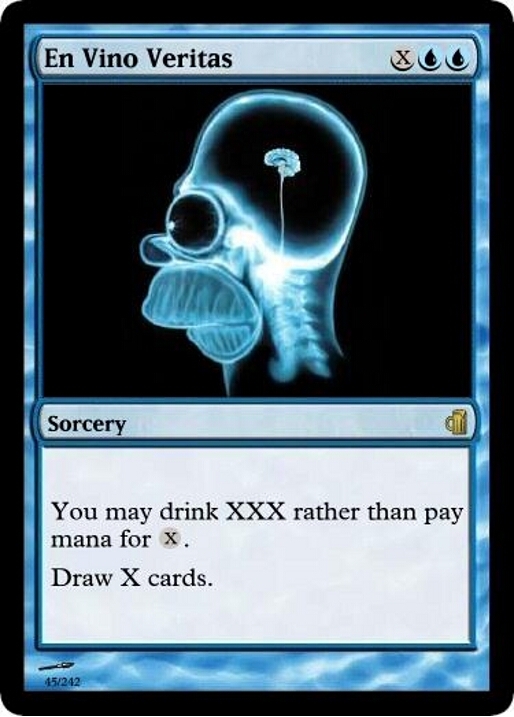 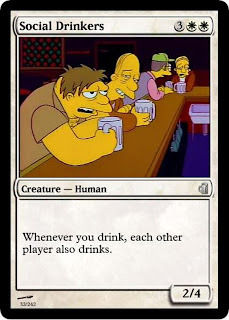 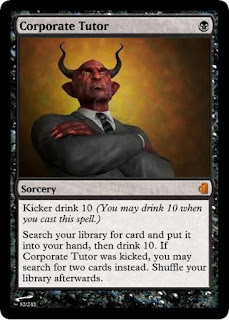 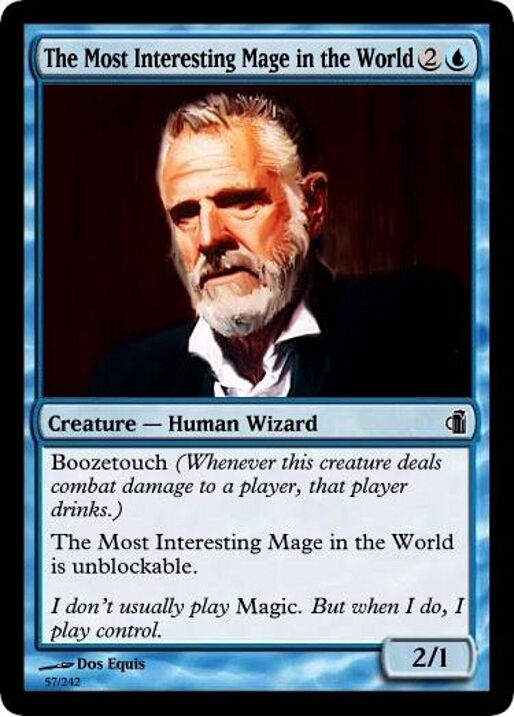 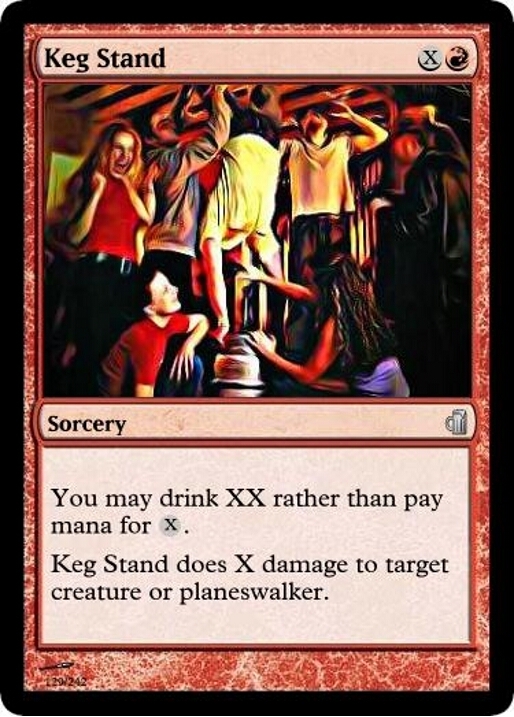 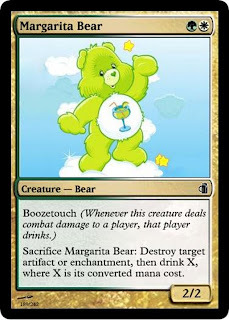 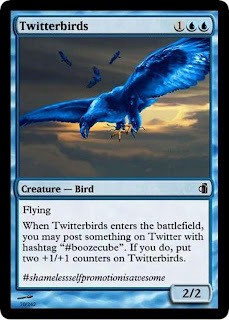 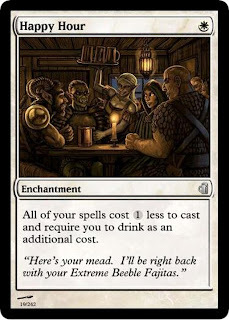 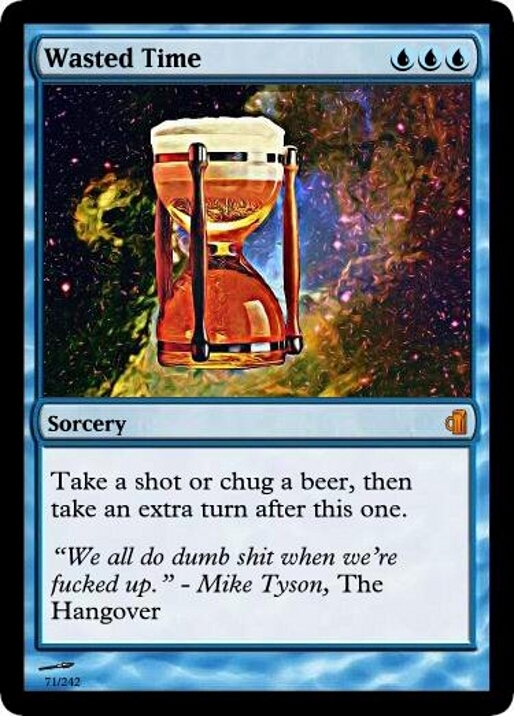 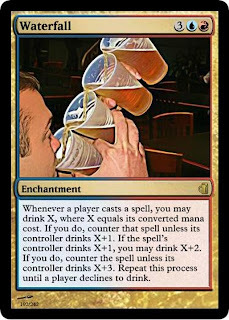 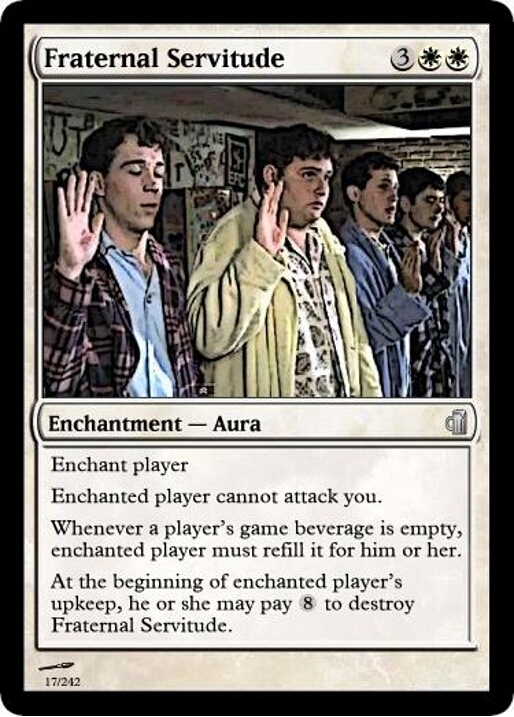 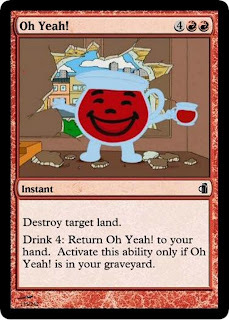 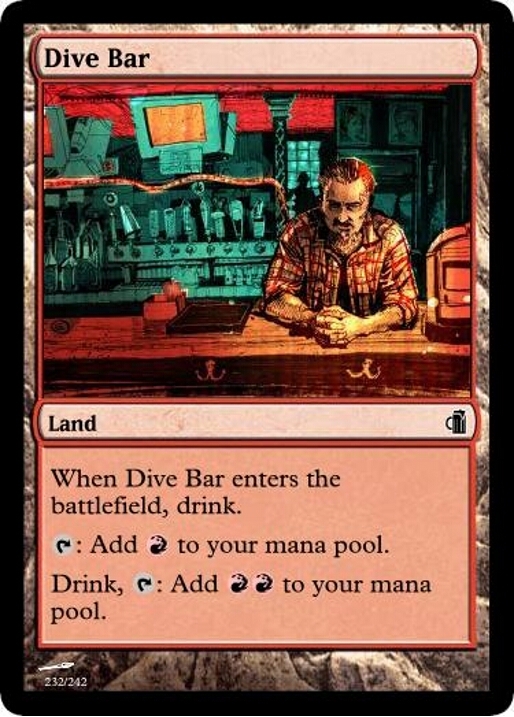 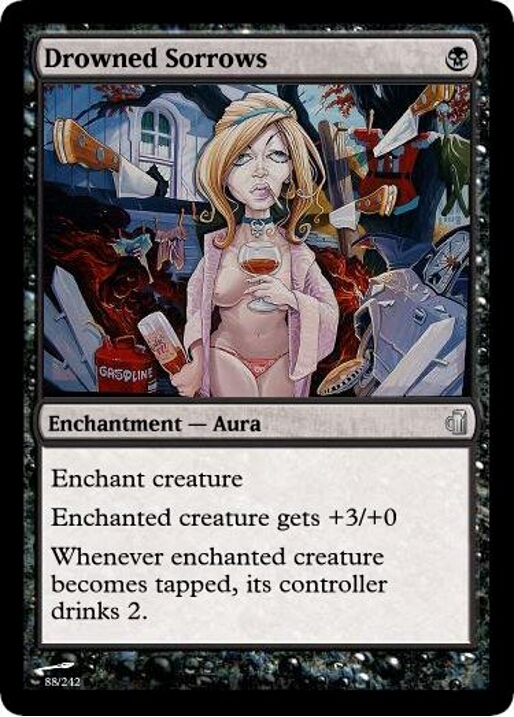 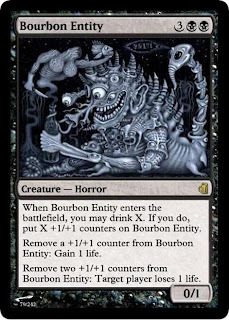 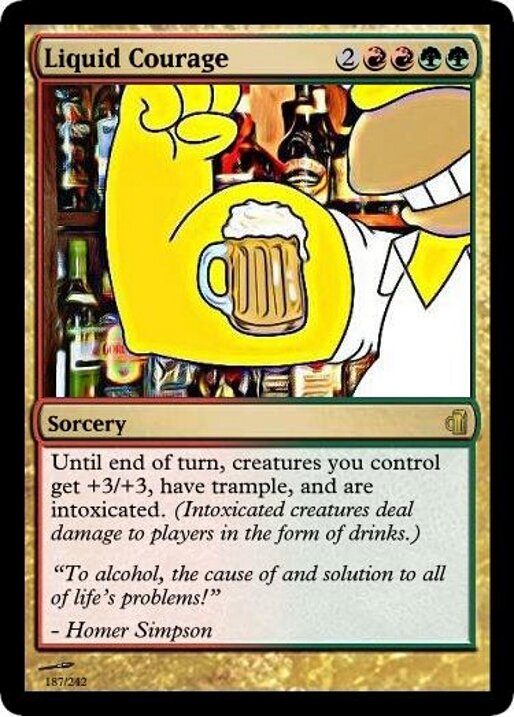 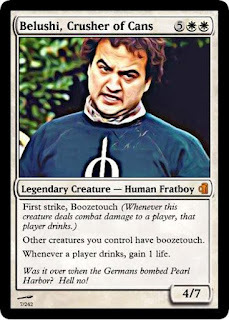 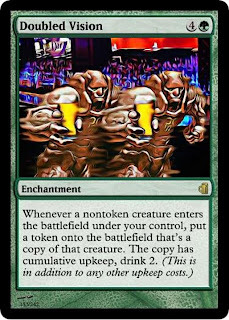 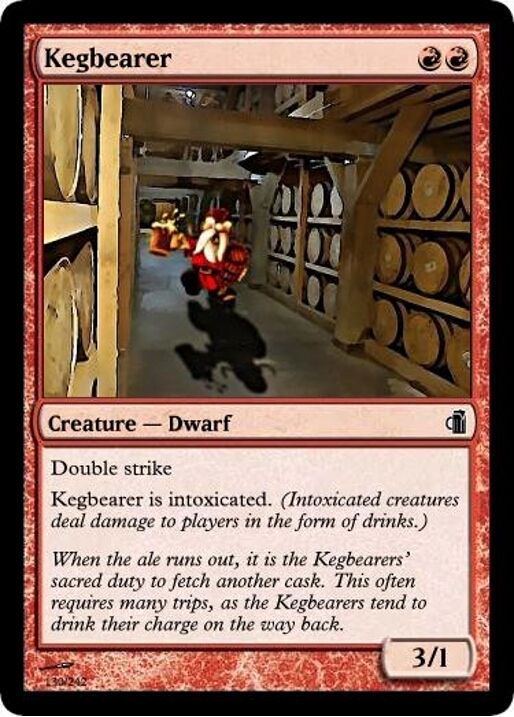 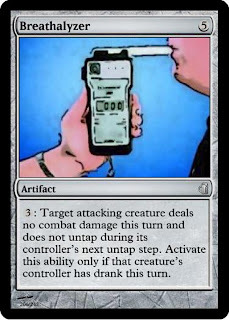 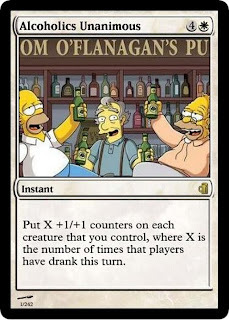 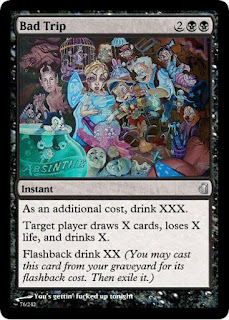 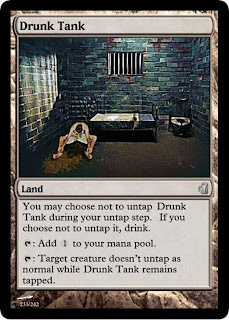 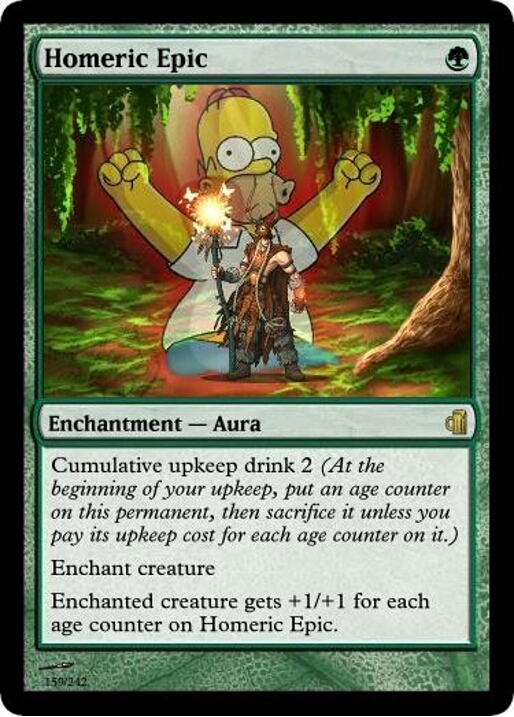 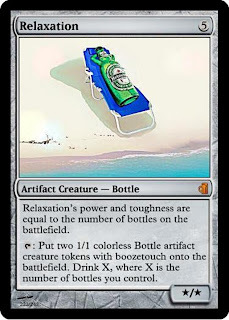 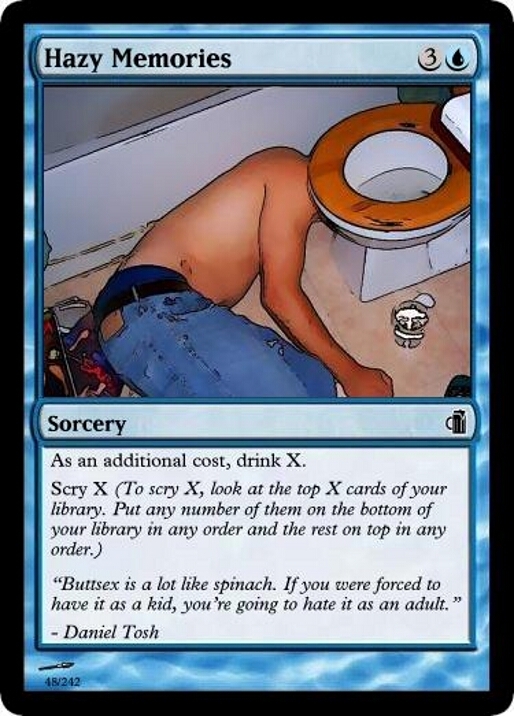 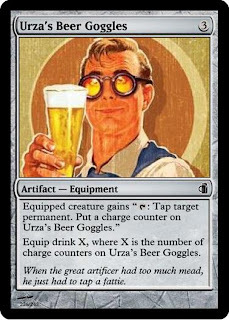 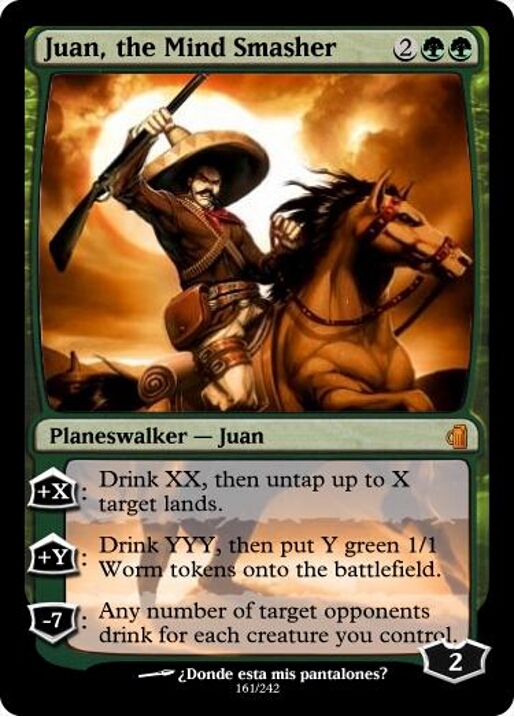 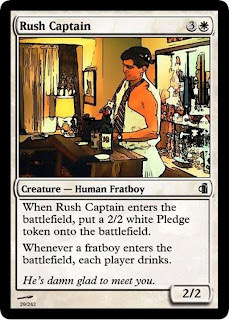 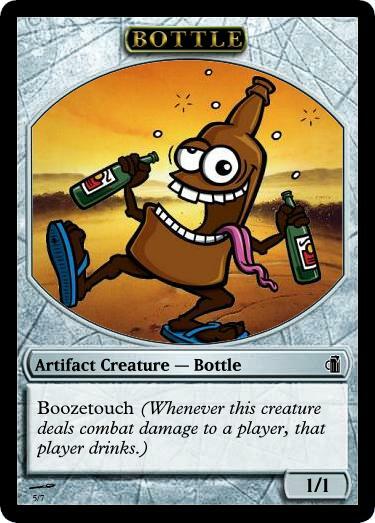 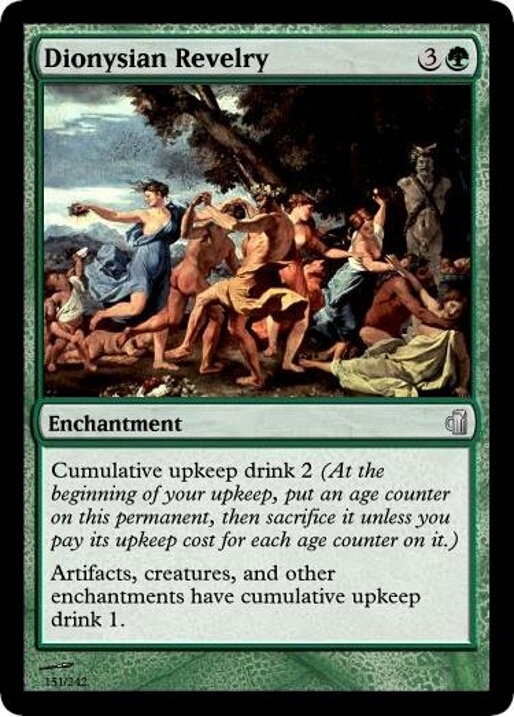 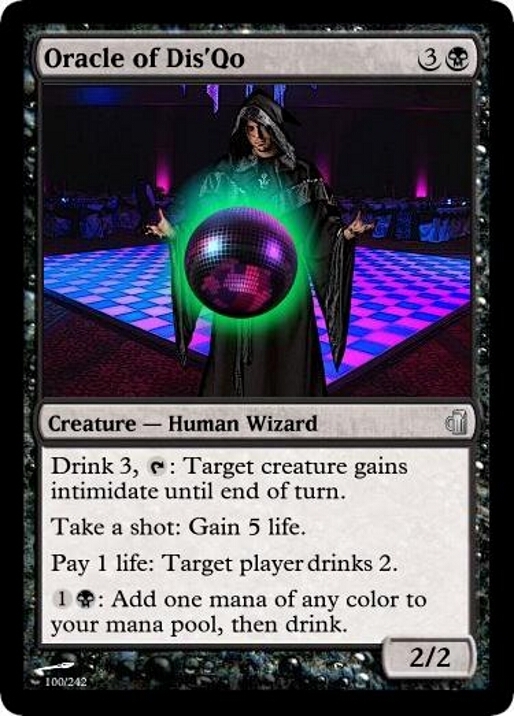 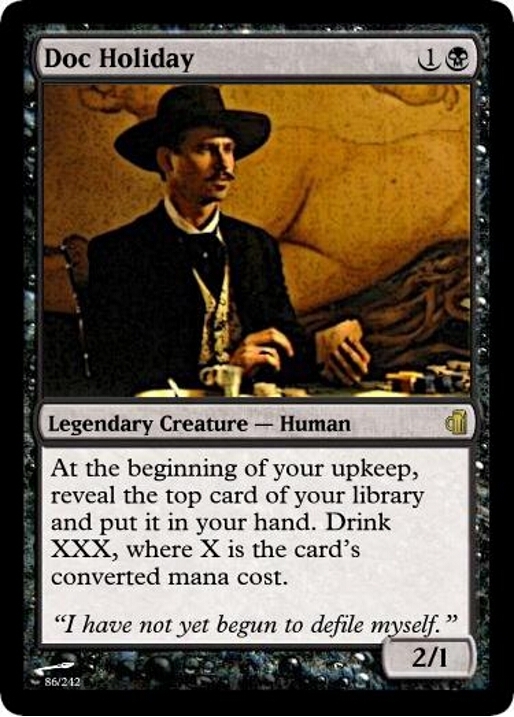 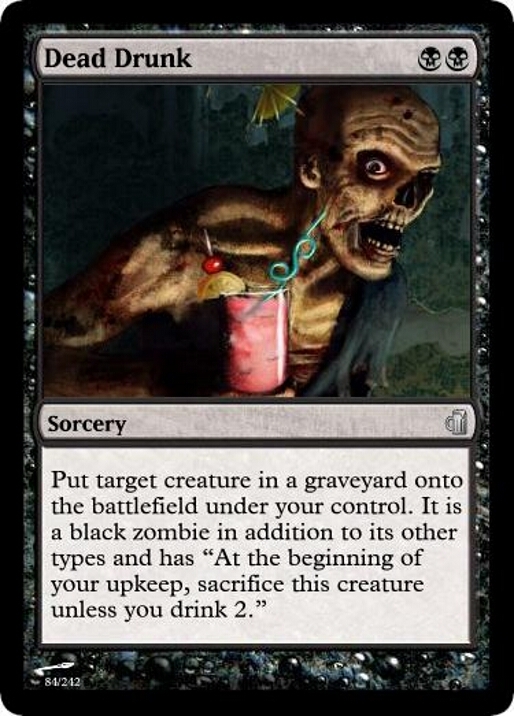 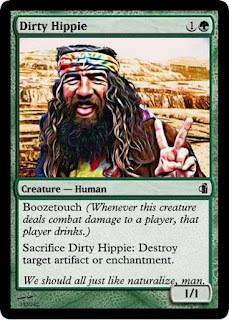 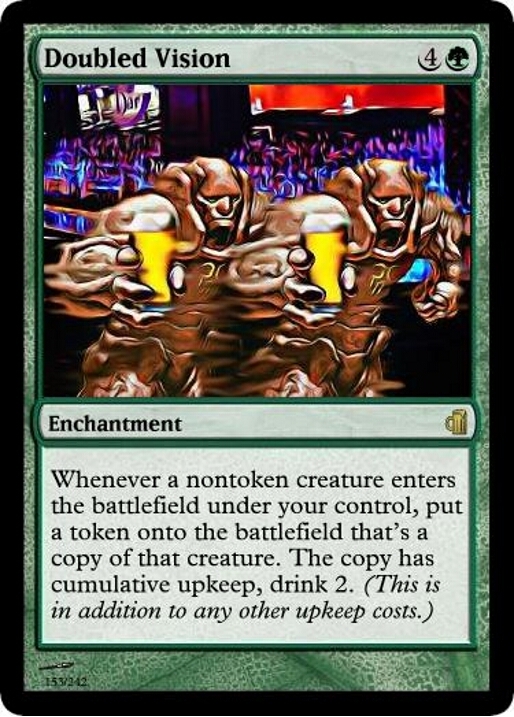 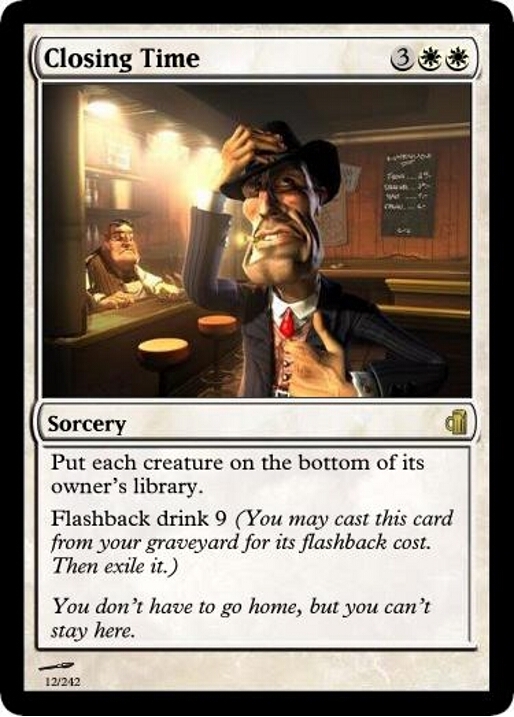 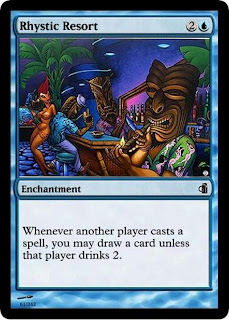 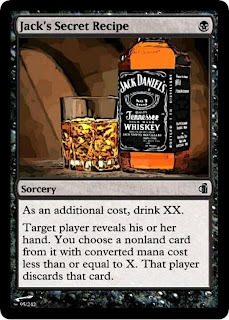 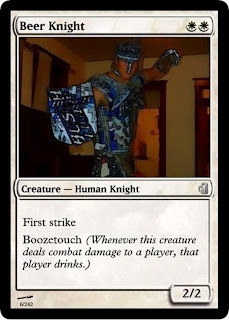 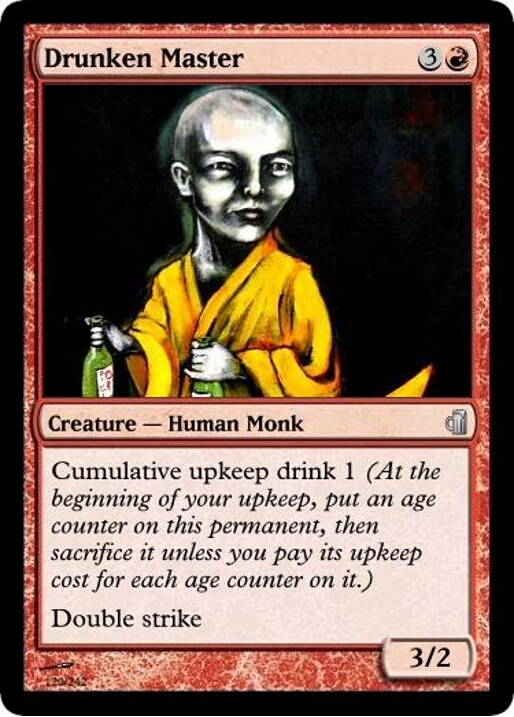 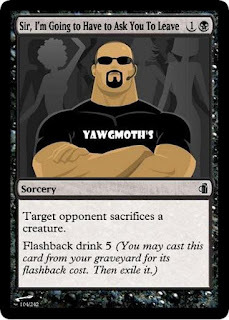 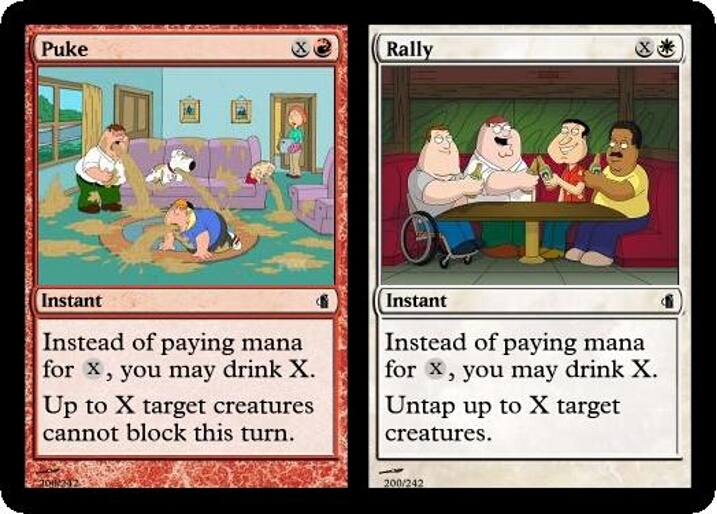 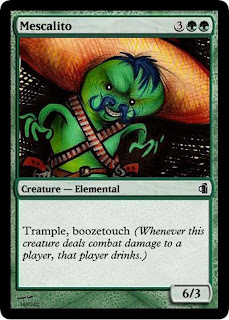 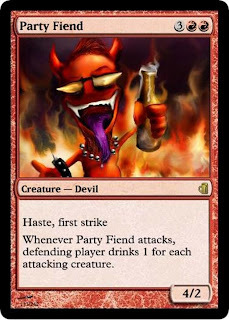 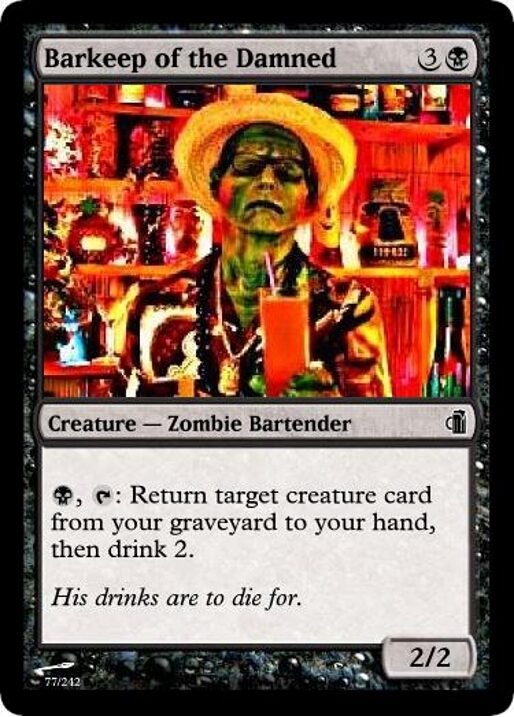 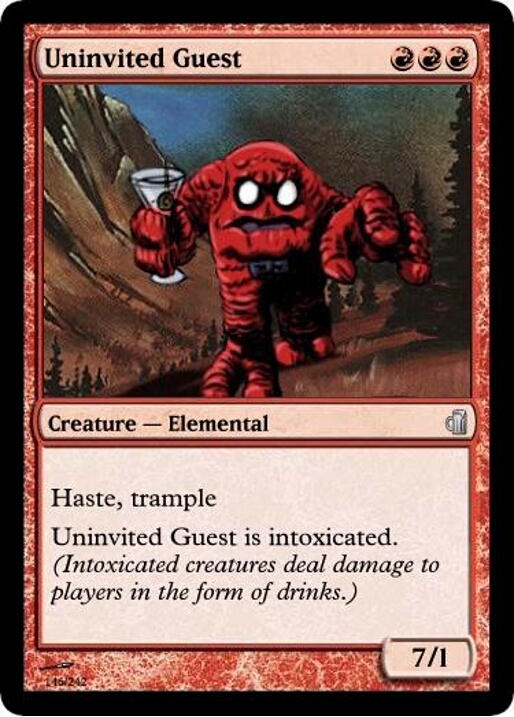 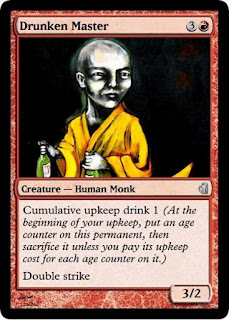 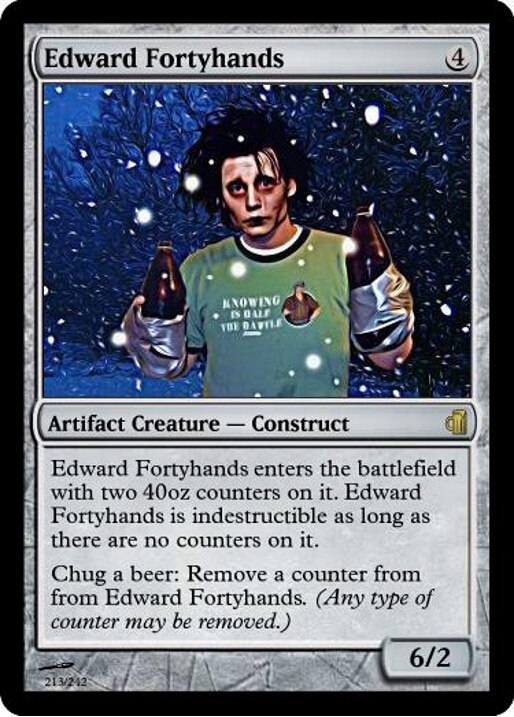 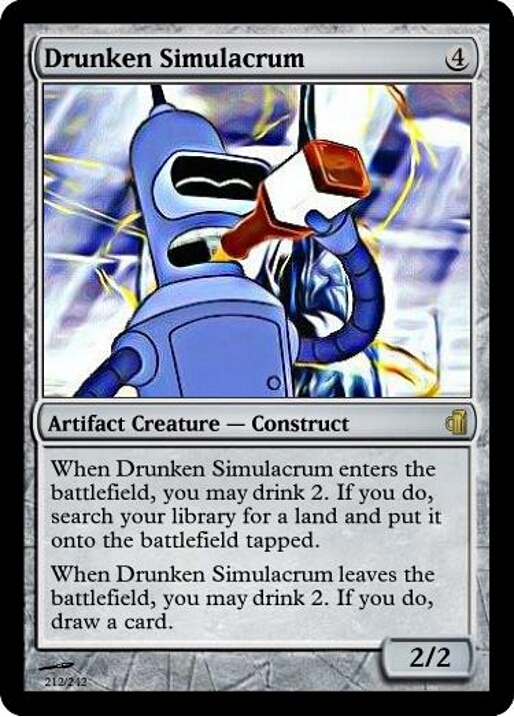 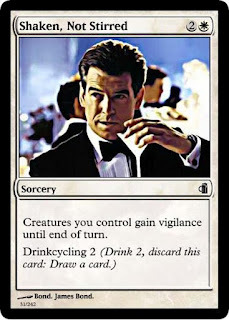 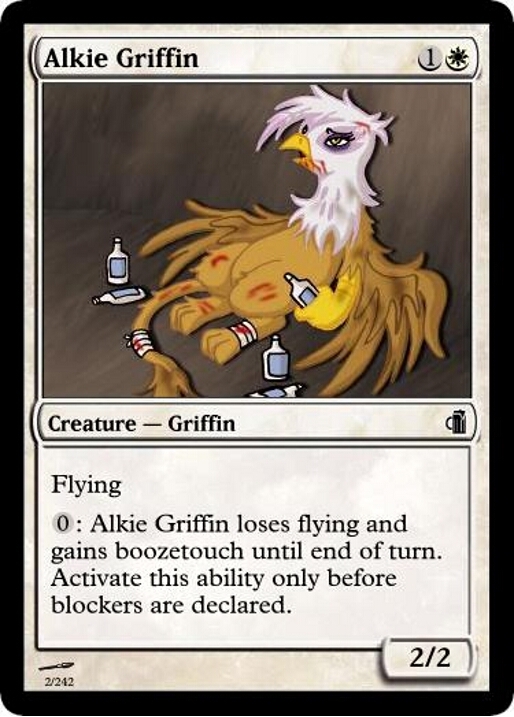 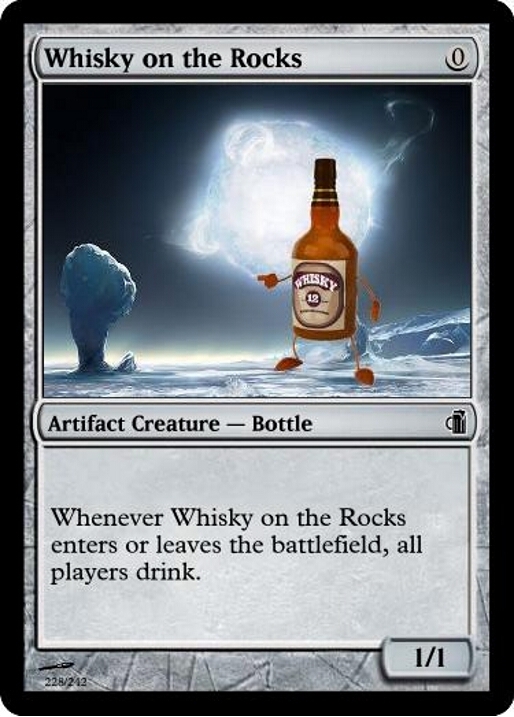 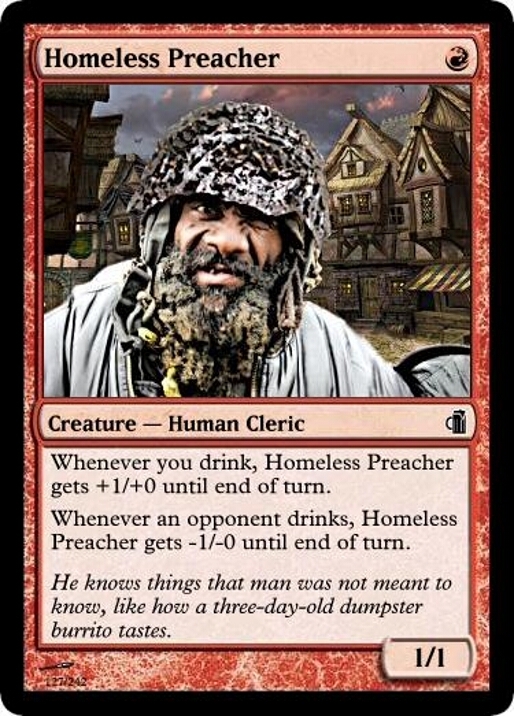 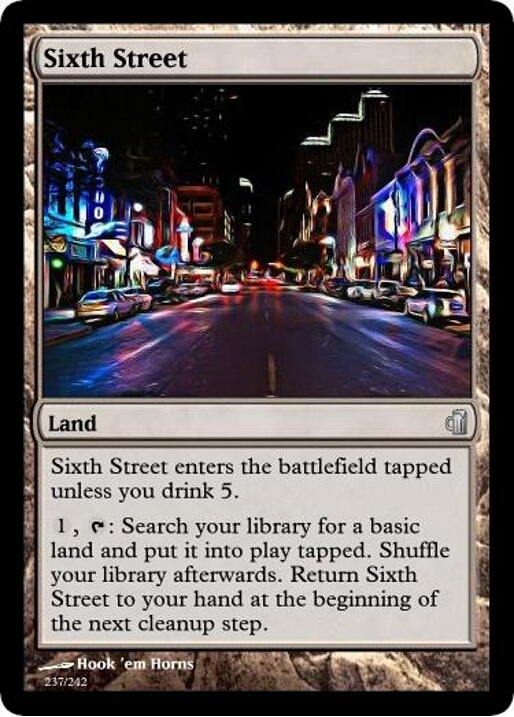 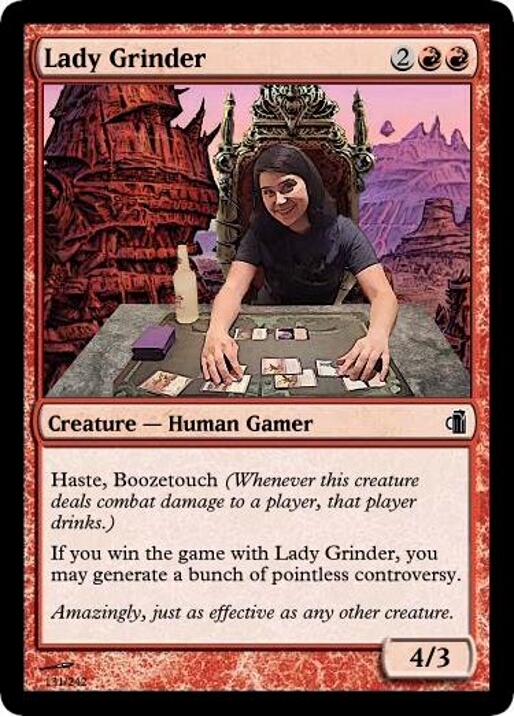 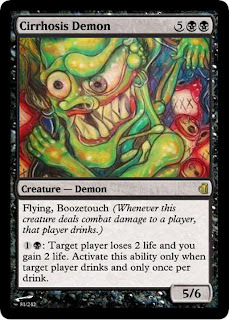 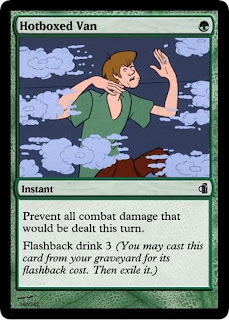 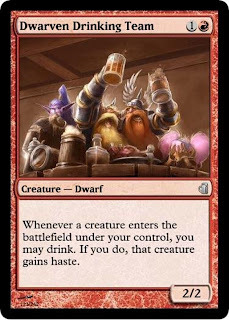 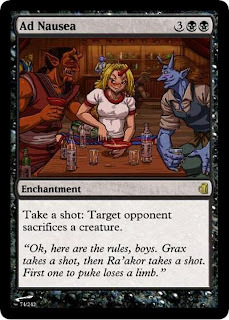 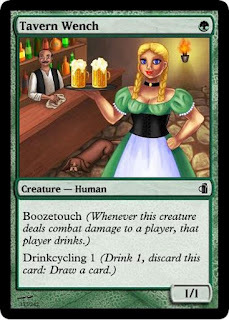 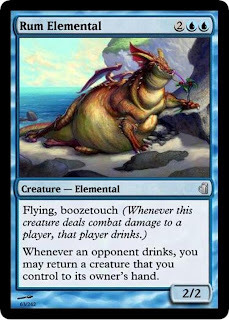 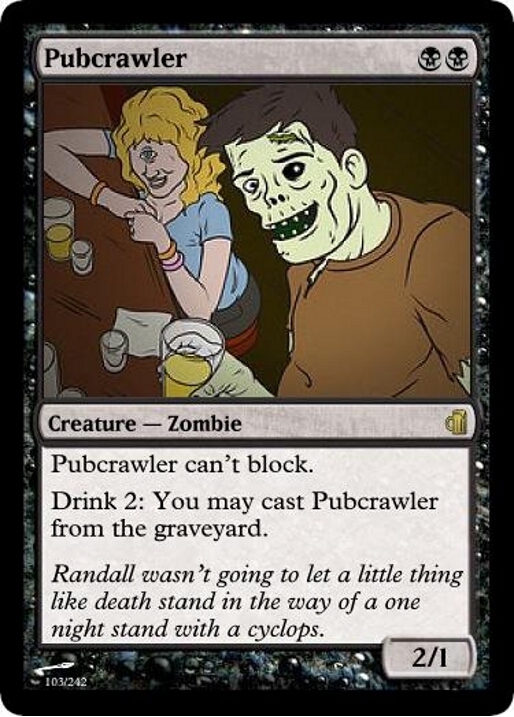 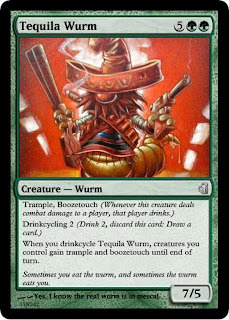 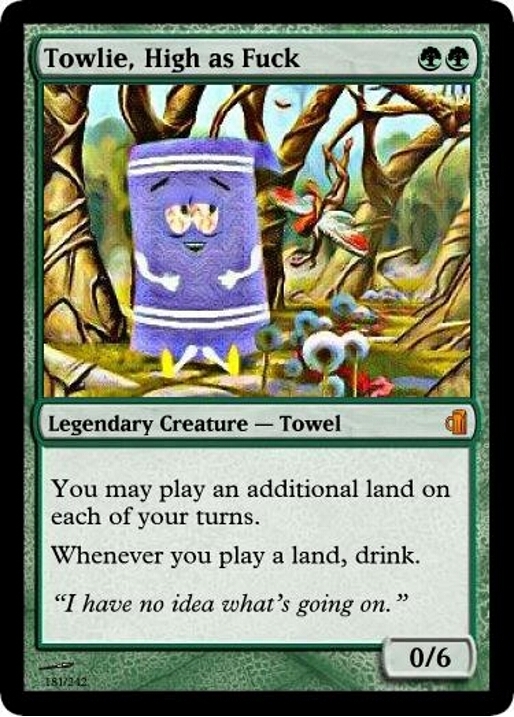 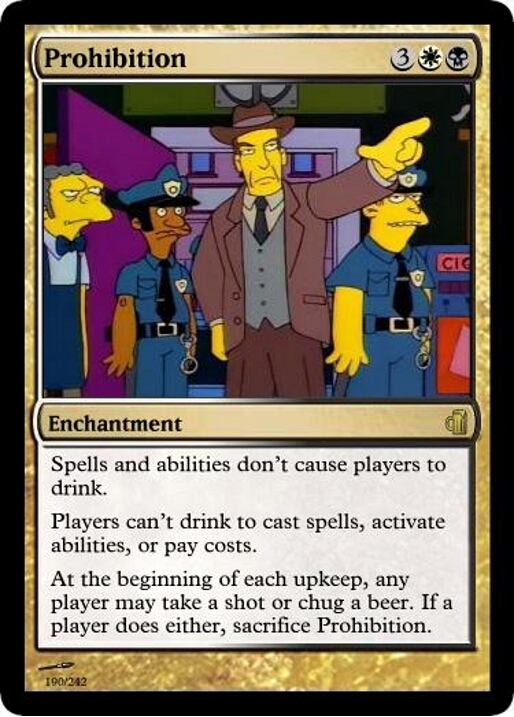 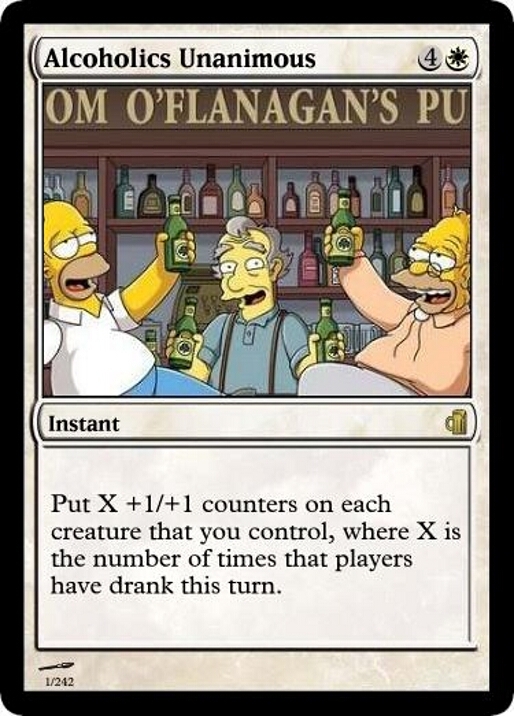 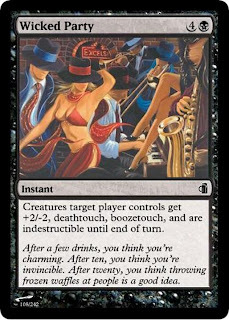 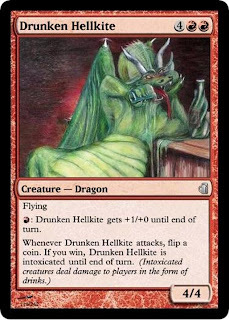 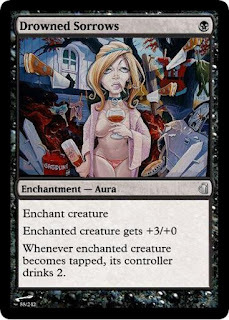 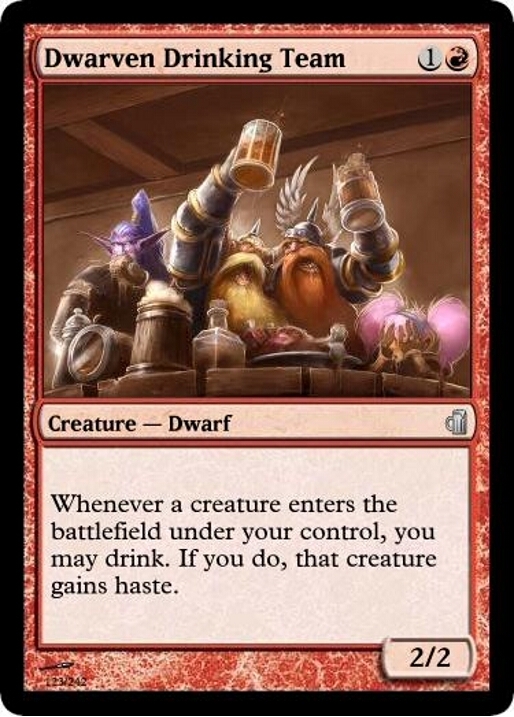 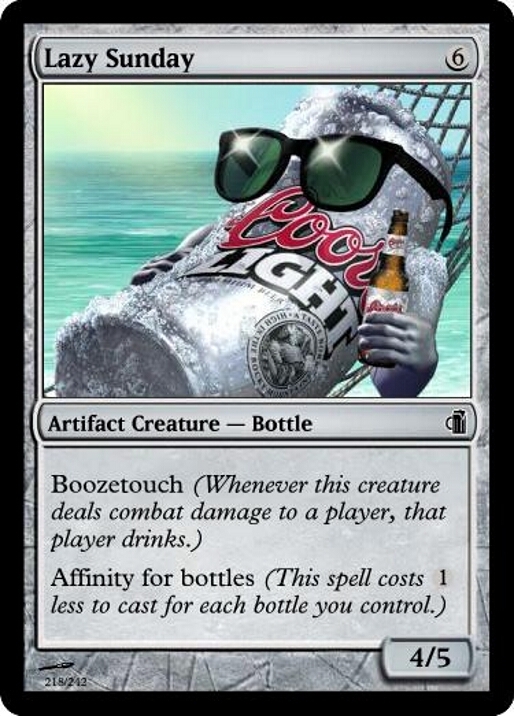 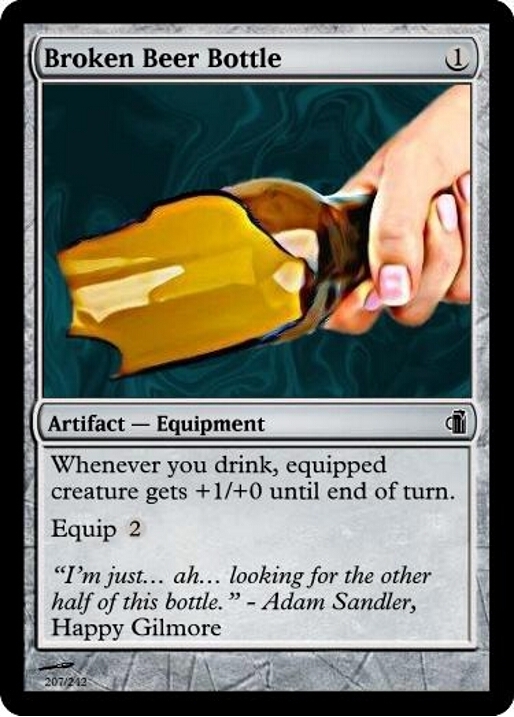 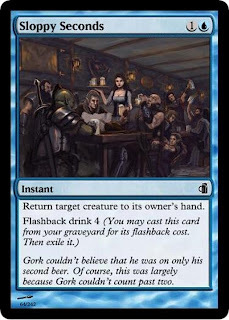 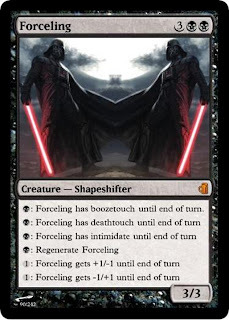 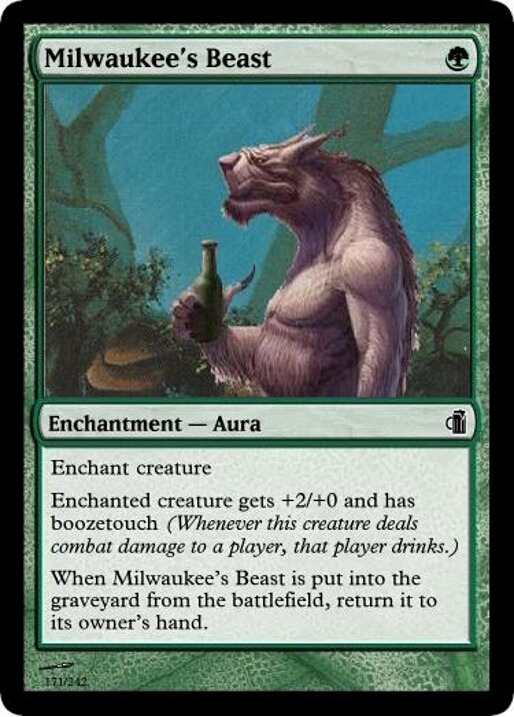 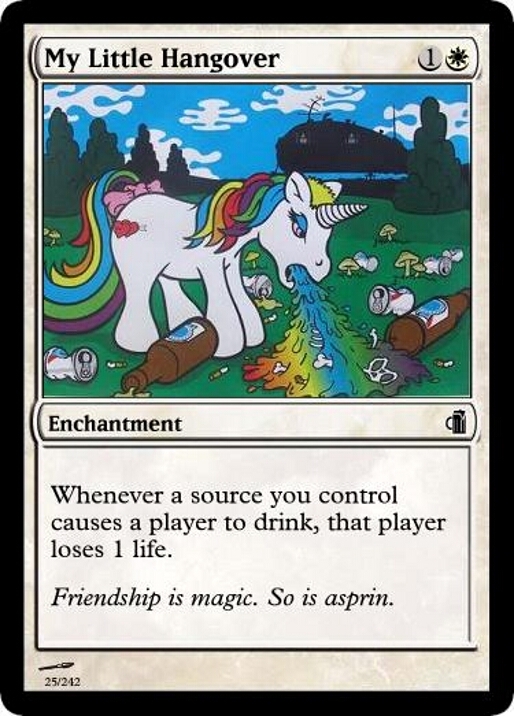 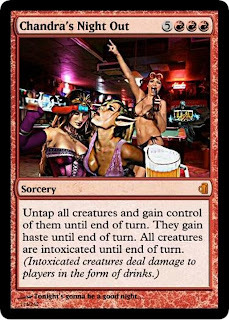 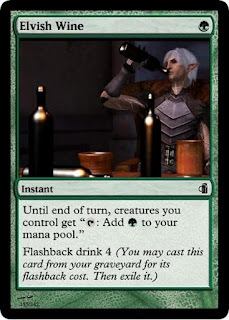 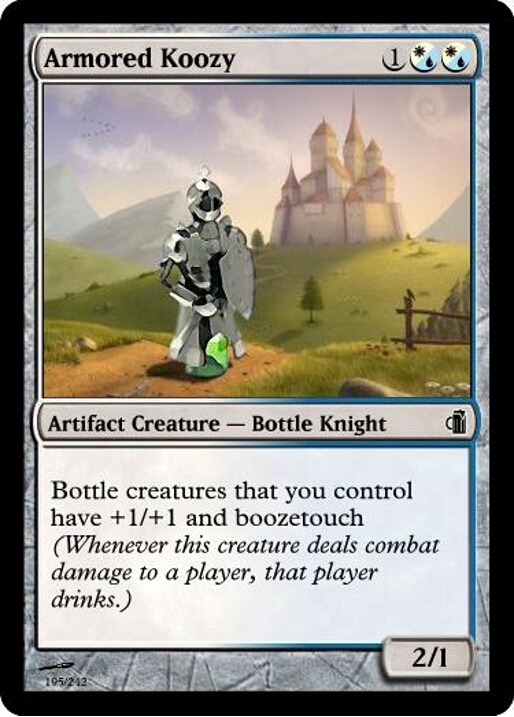 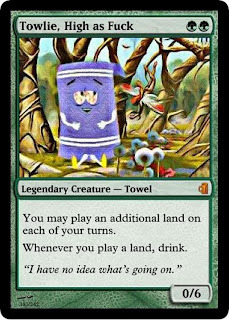 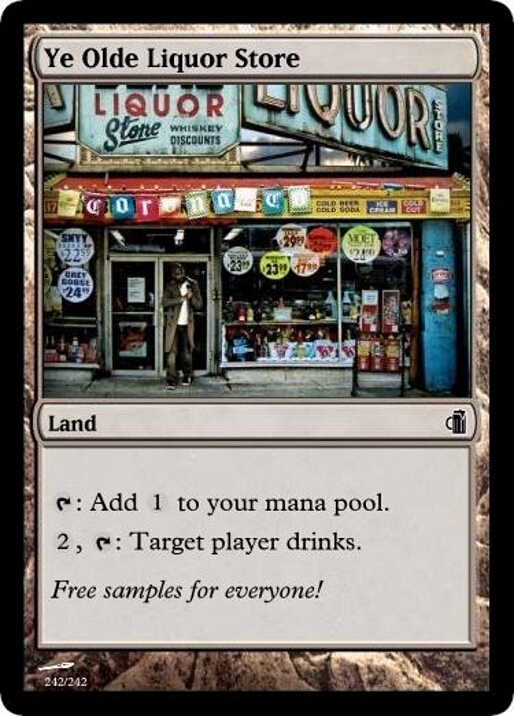 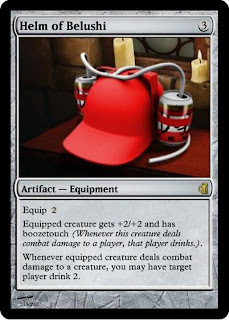 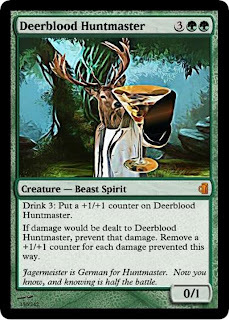 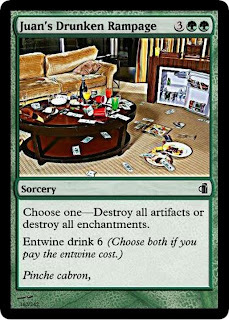 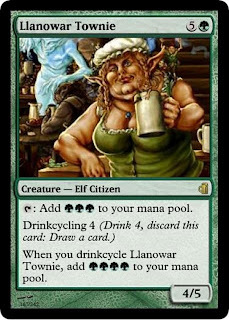 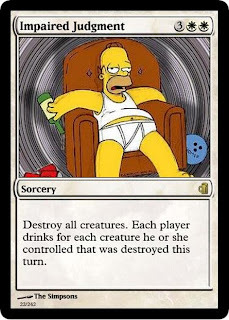 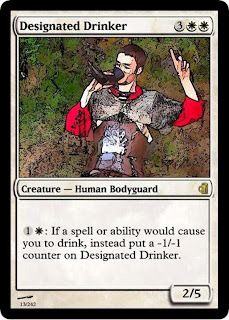 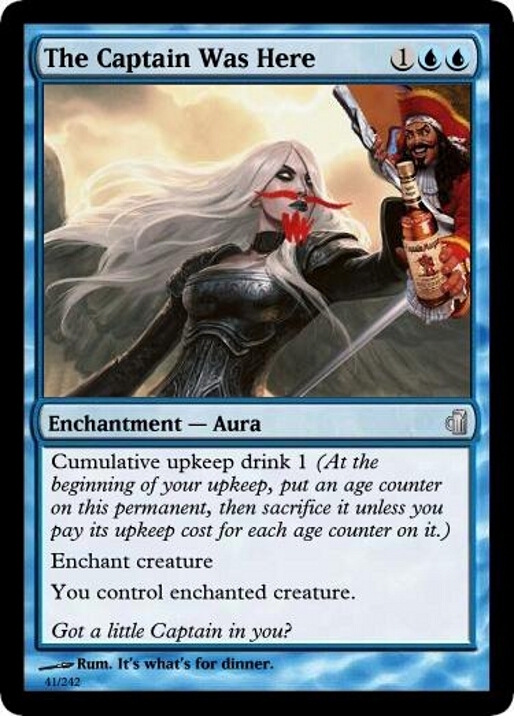 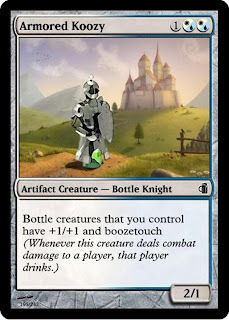 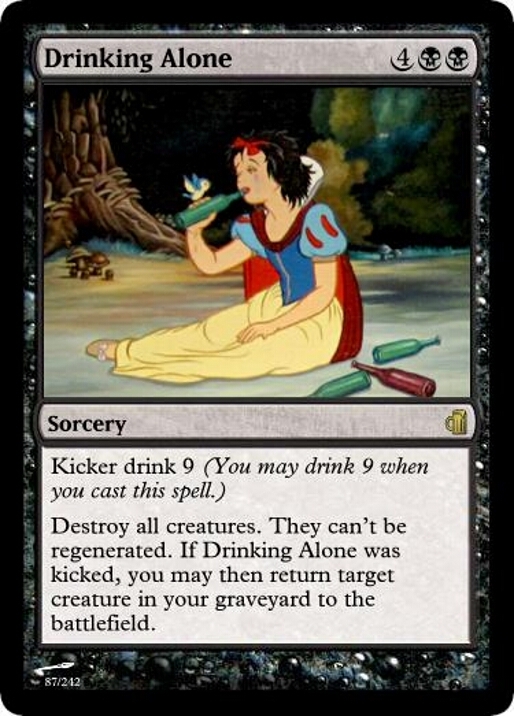 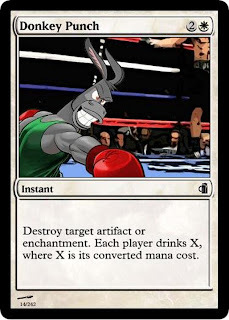 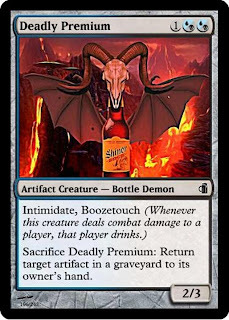 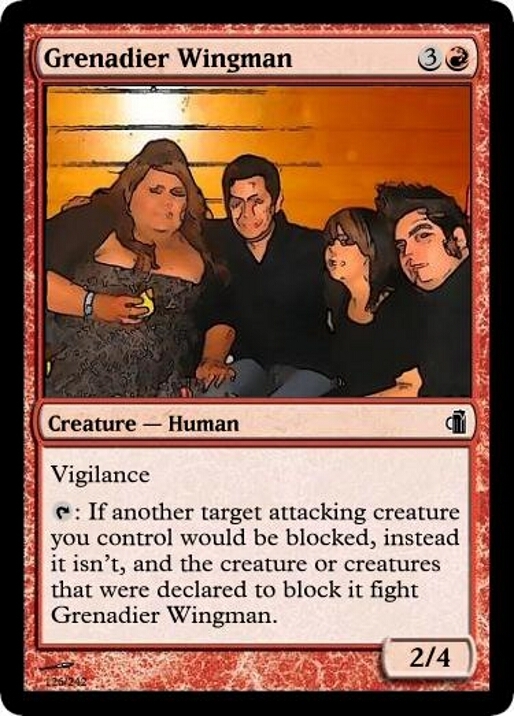 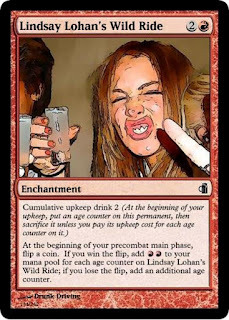 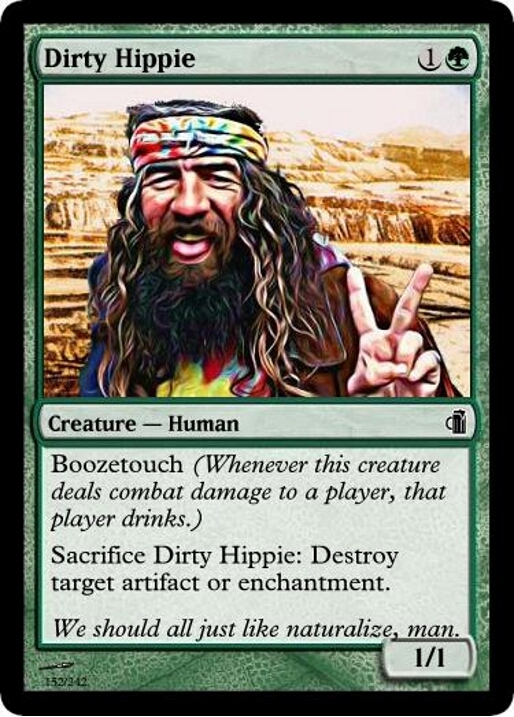 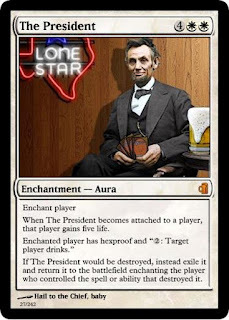 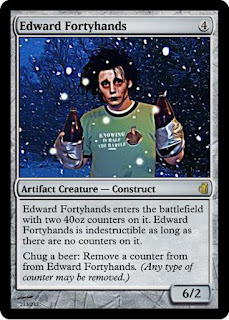 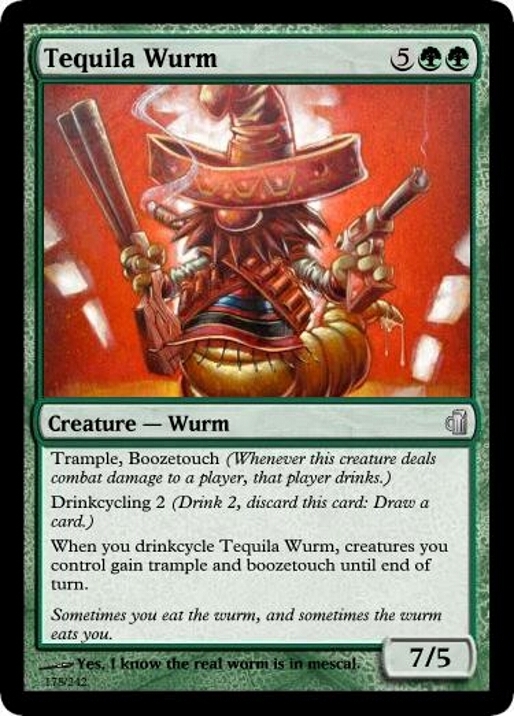 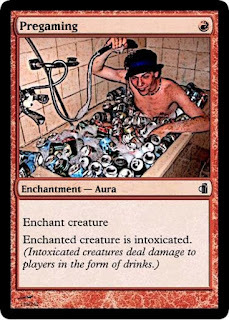 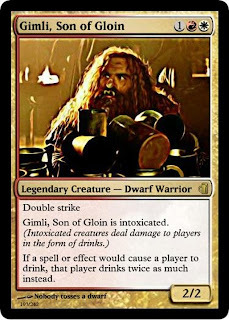 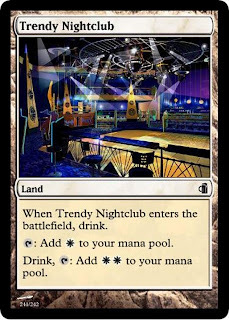 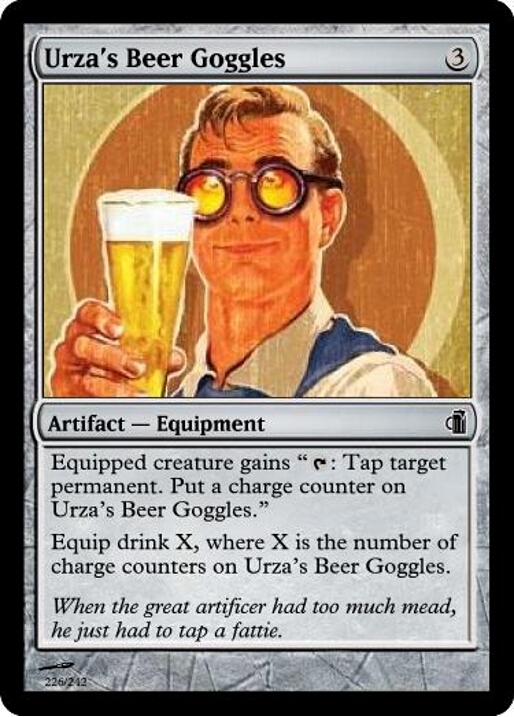 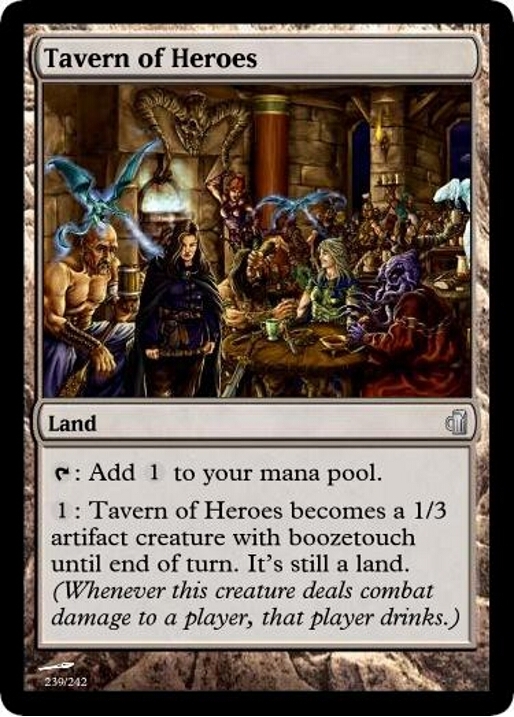 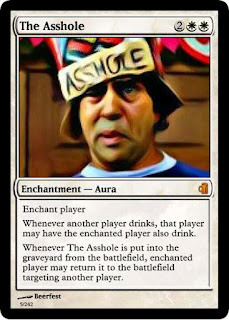 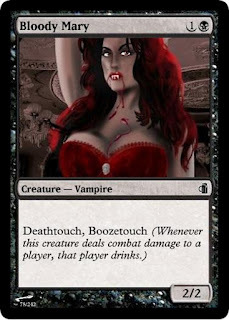 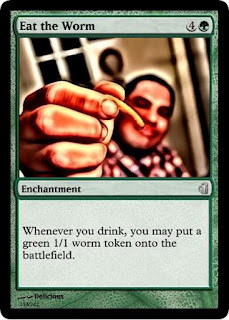 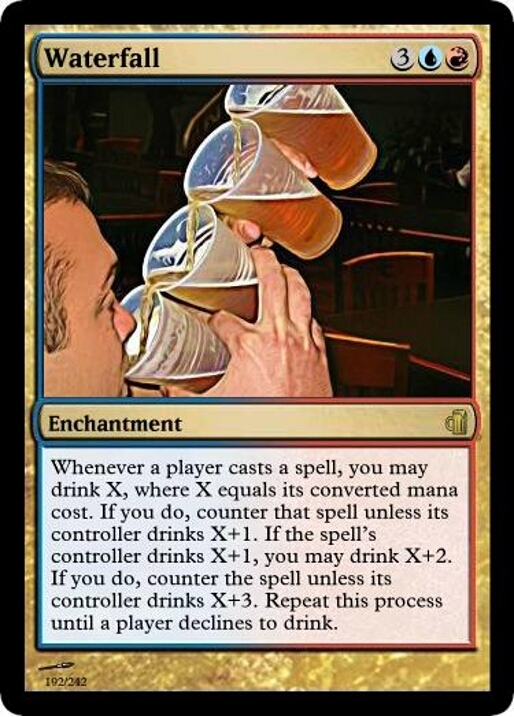 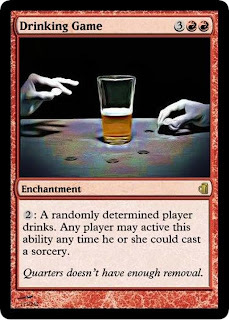 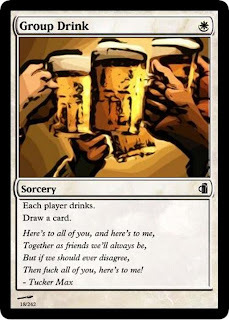 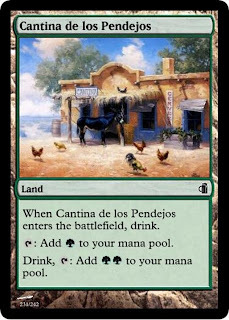 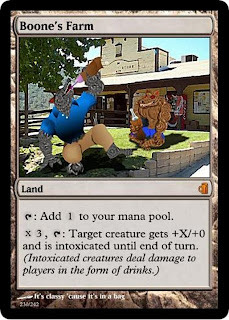 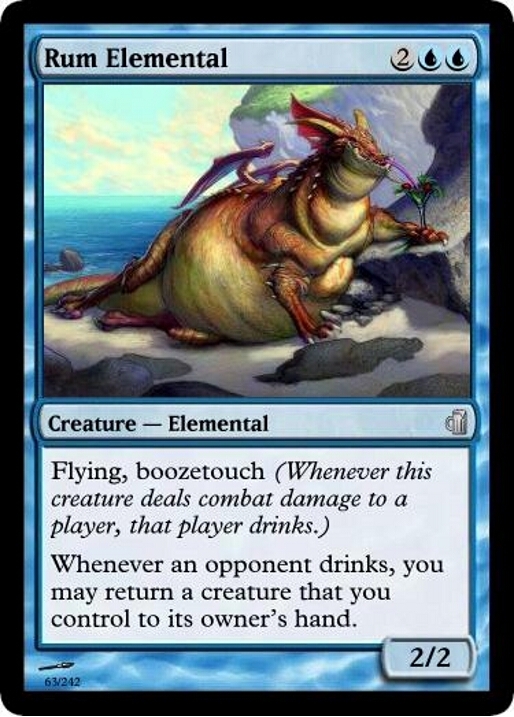 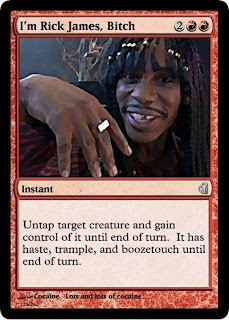 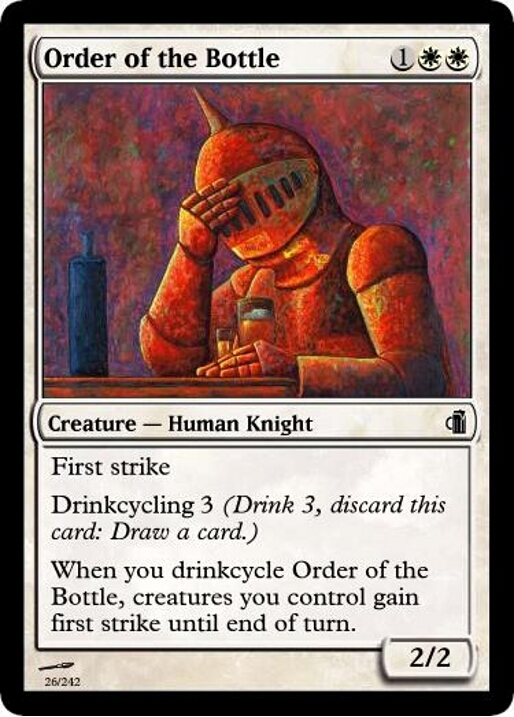 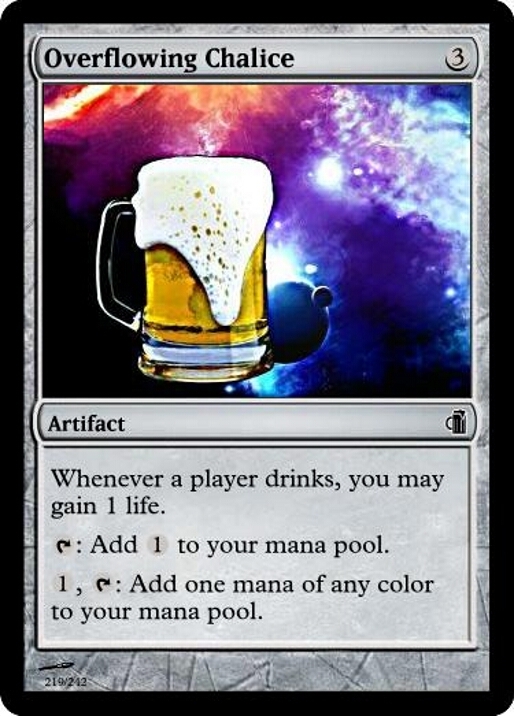 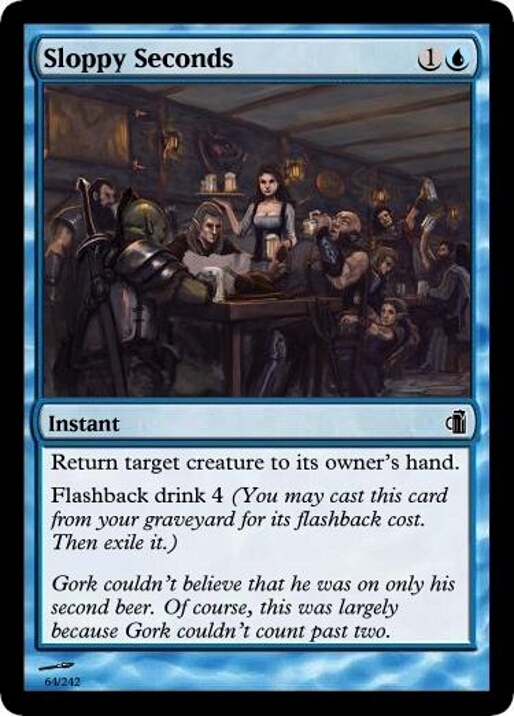 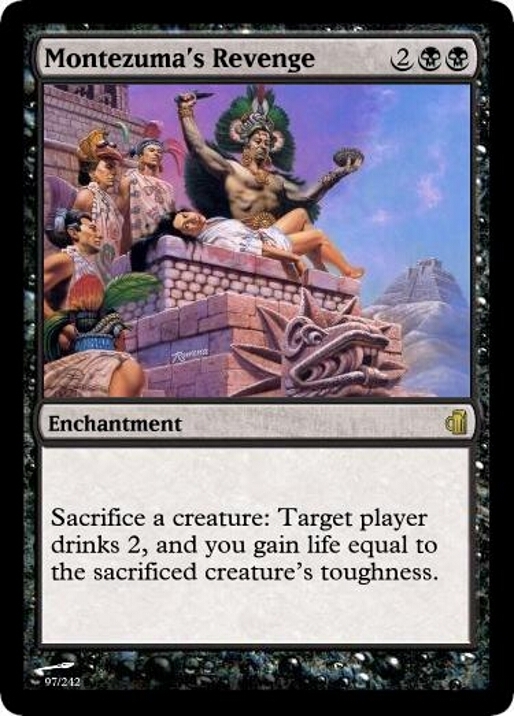 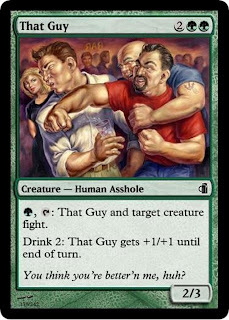 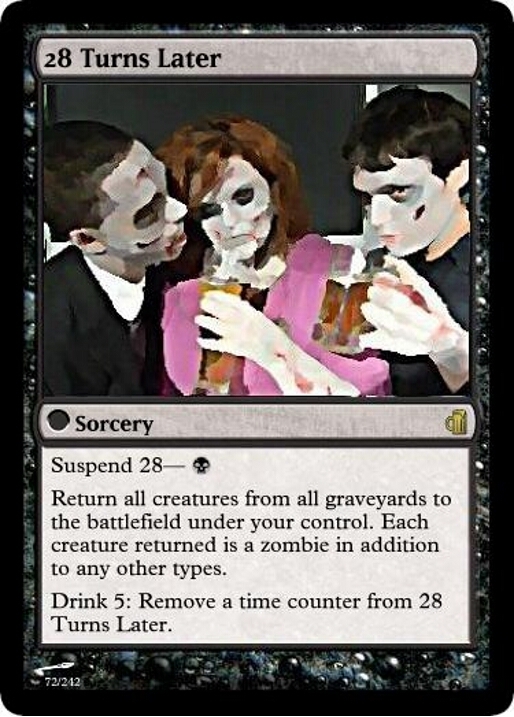 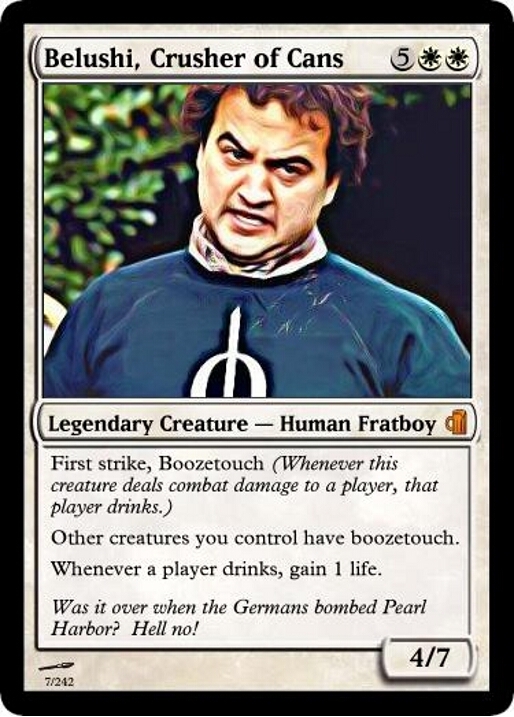 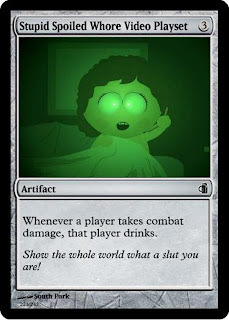 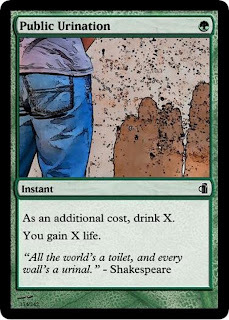 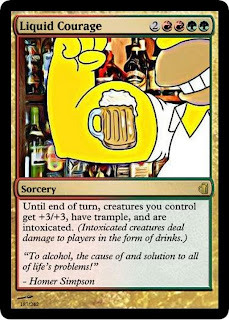 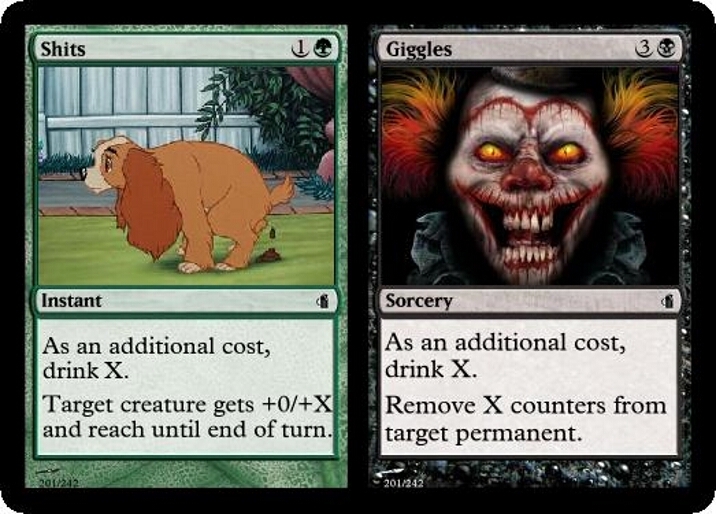 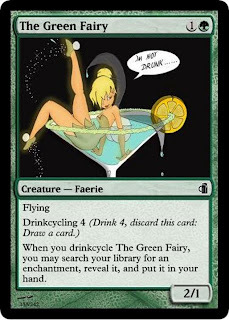 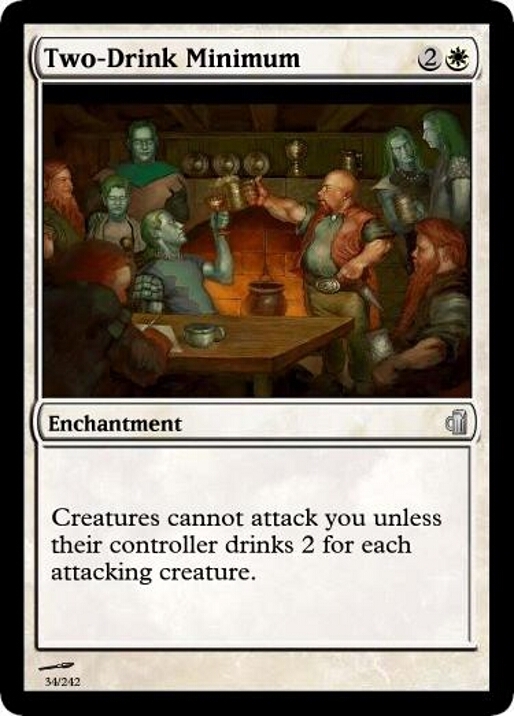 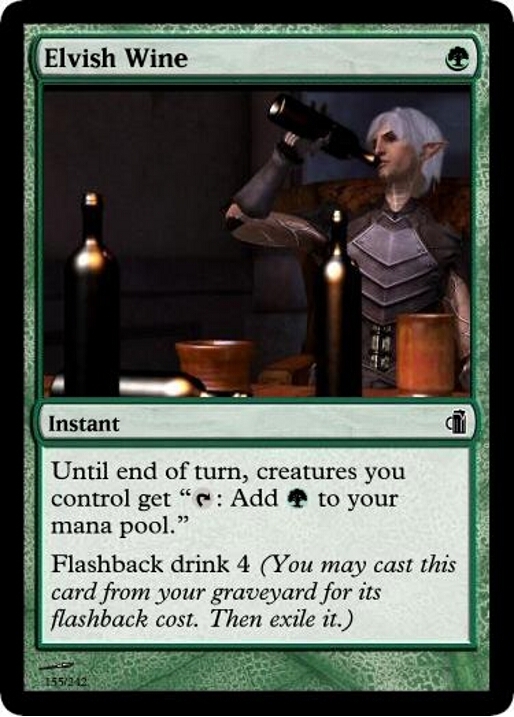 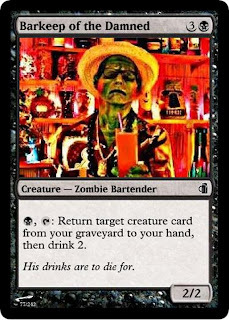 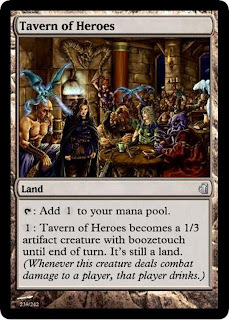 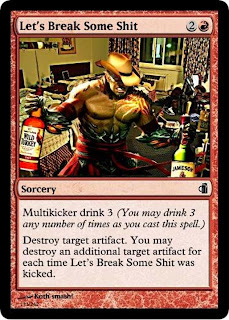 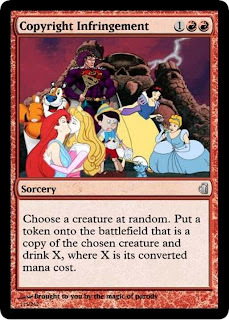 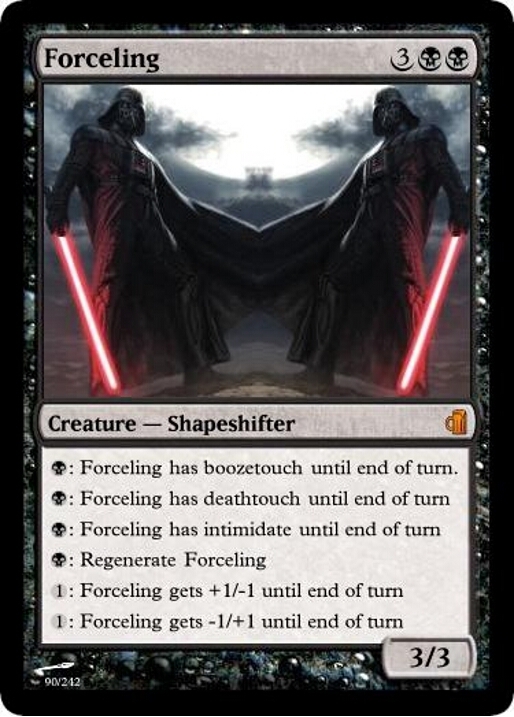 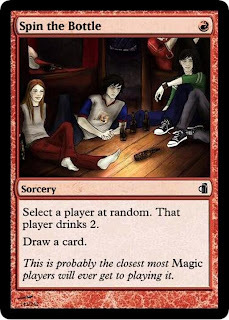 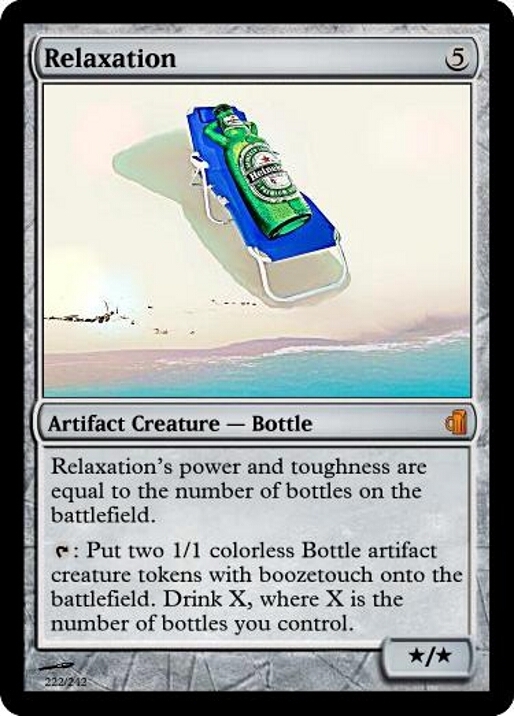 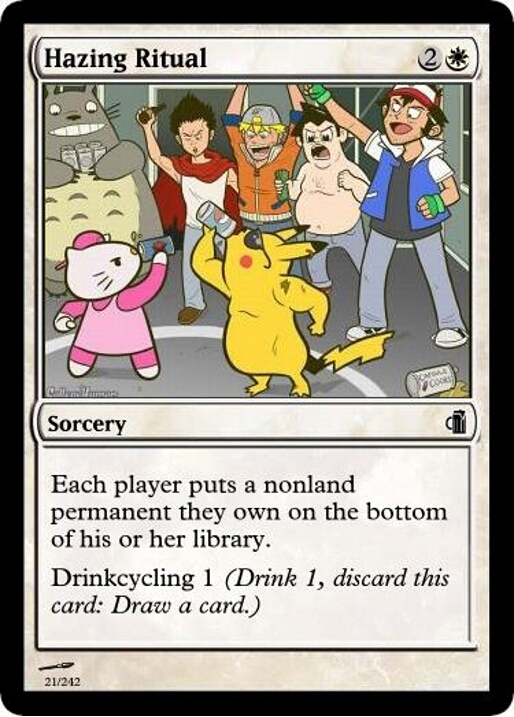 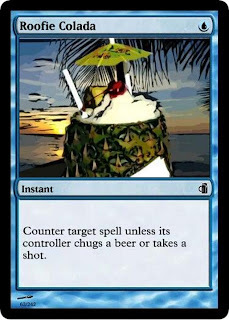 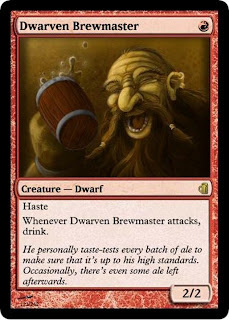 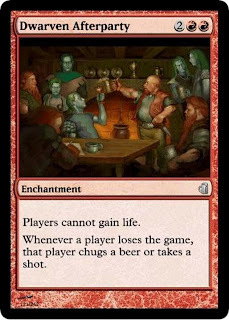 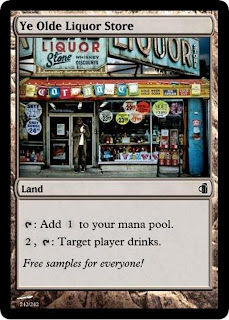 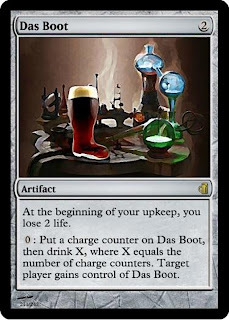 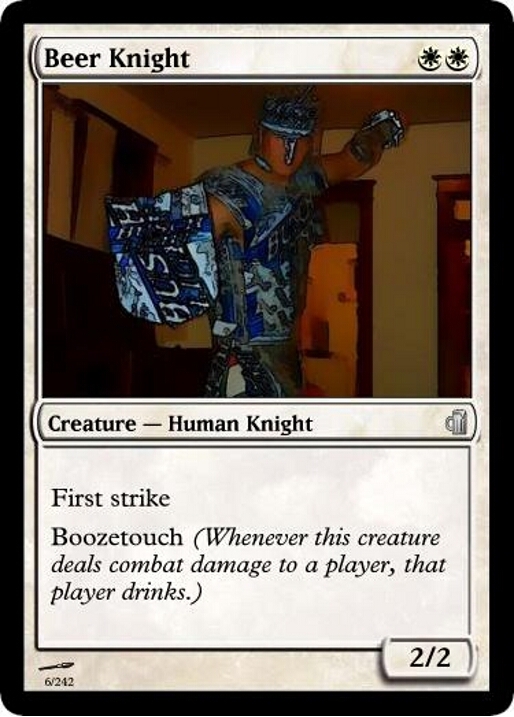 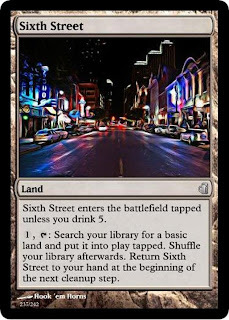 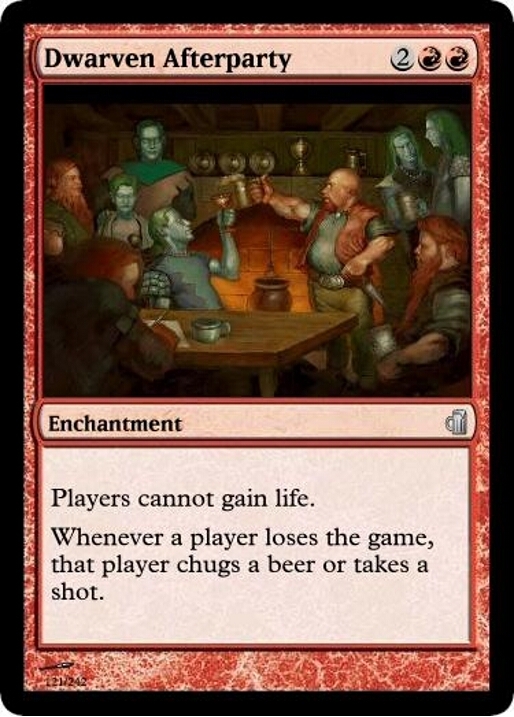 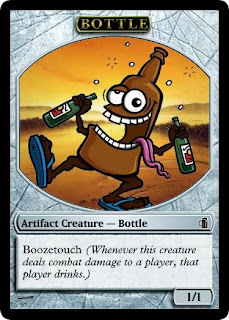 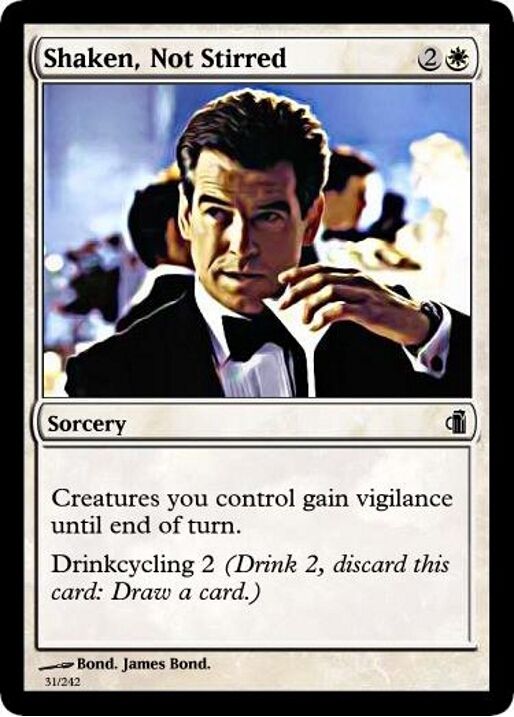 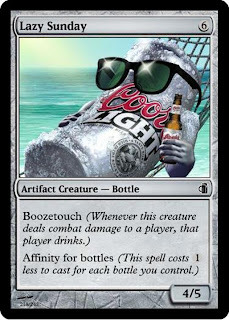 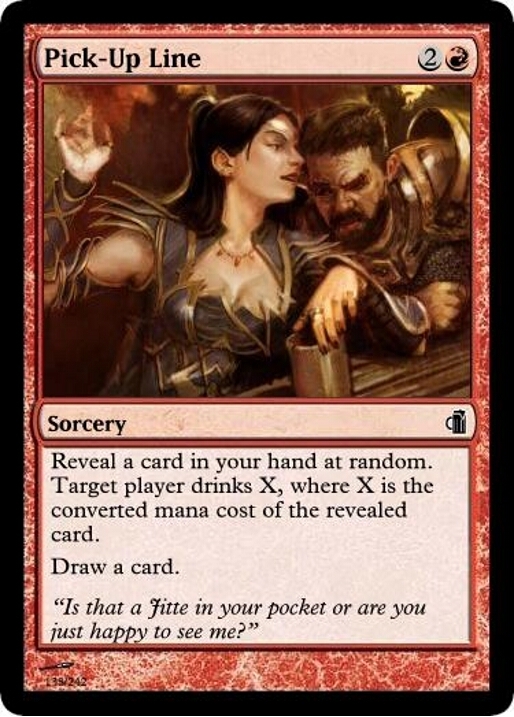 A suggestion to the makers concerning the Booze Cube Print Sheets: Align each card at the exact same position on each jpg image, and with the same size. 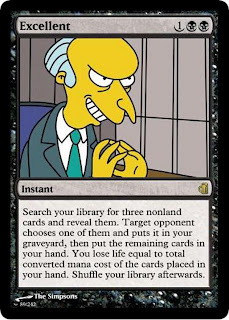 That way you can print the images and lay the papers on top of each other and then just cut out all cards at the same time (without cutting into the cards that are on the papers not on top). 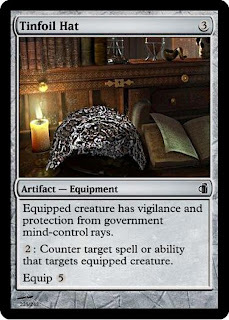 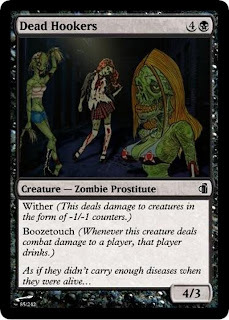 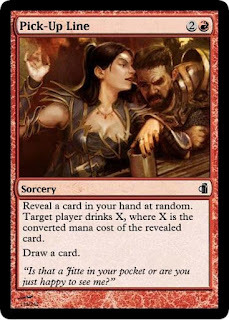 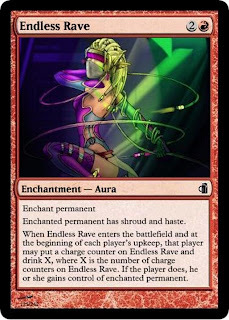 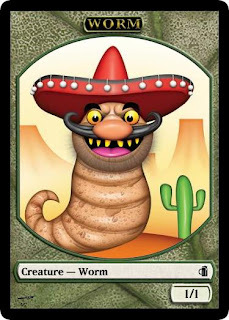 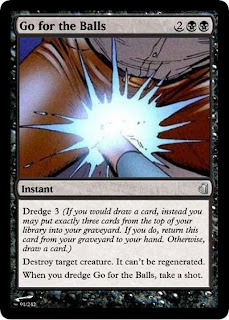 As it is now the exact position of each card varies a little on each jpg image, enough to ruin how pretty the cards are. 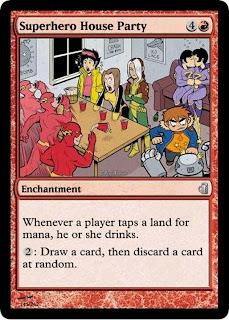 I play-tested this game and I don't remember the end of game 1. 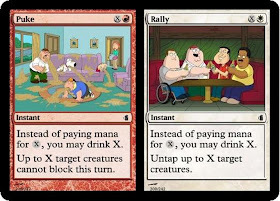 It's sweet if you're constantly creating new cards, but I think having things consistent across the board is first priority. 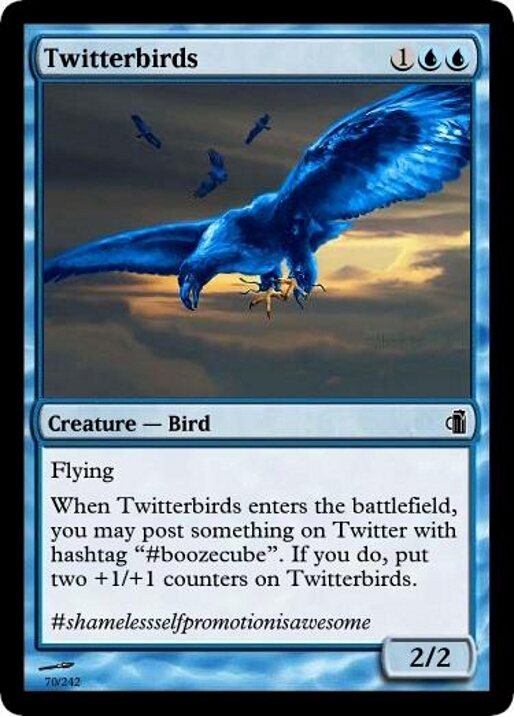 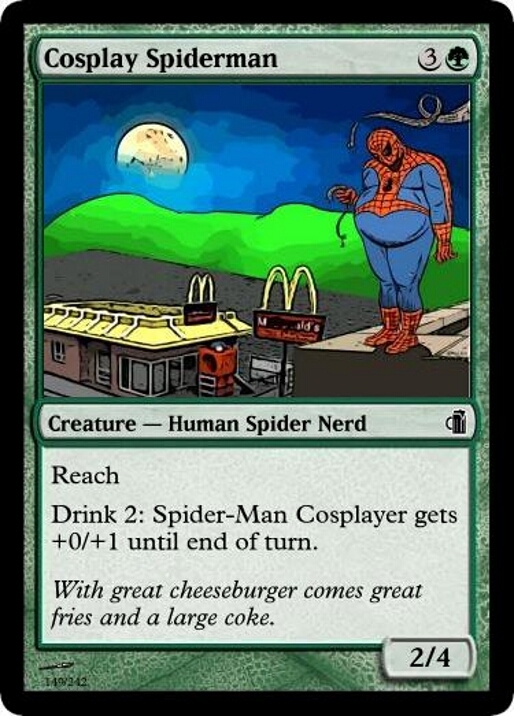 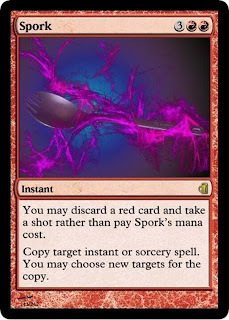 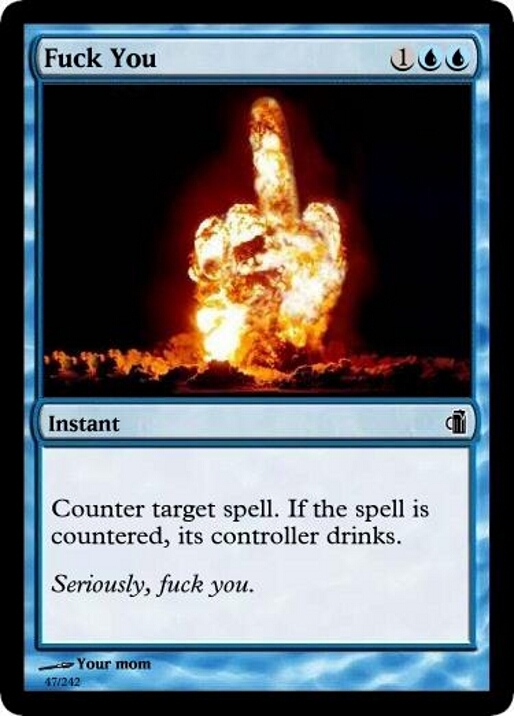 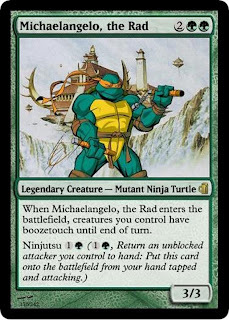 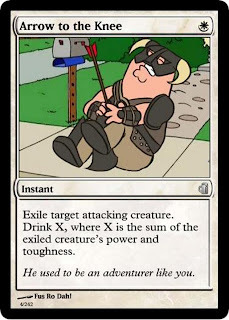 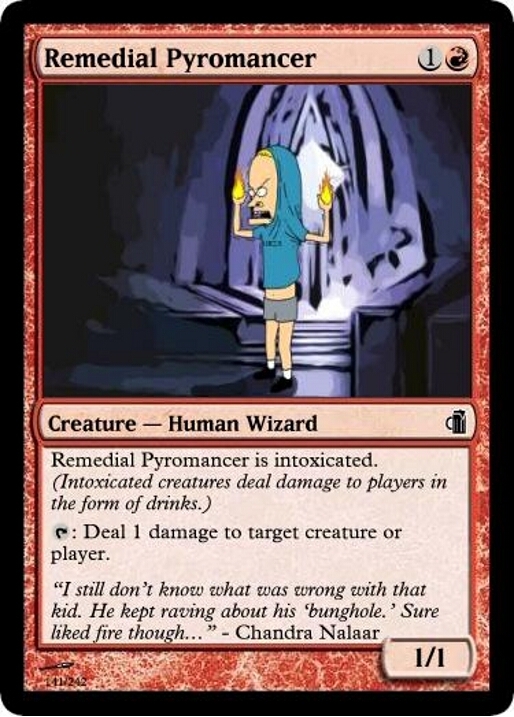 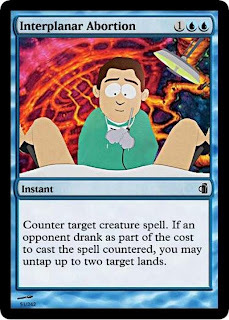 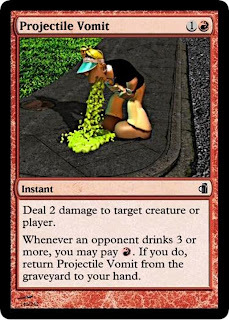 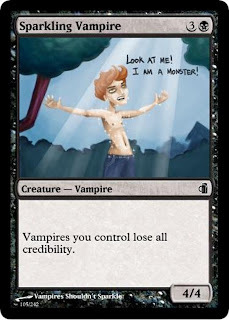 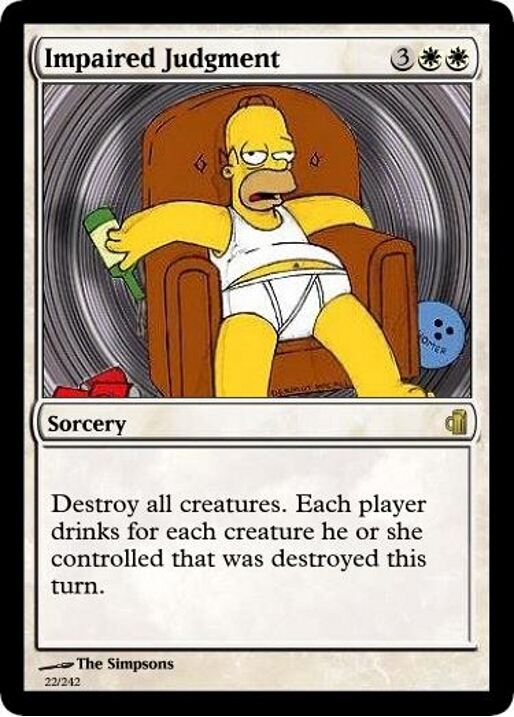 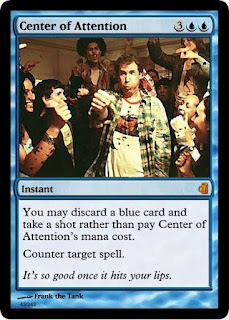 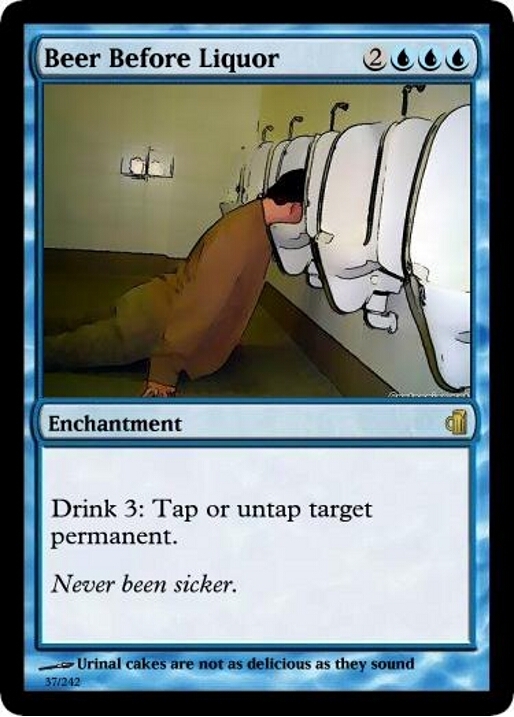 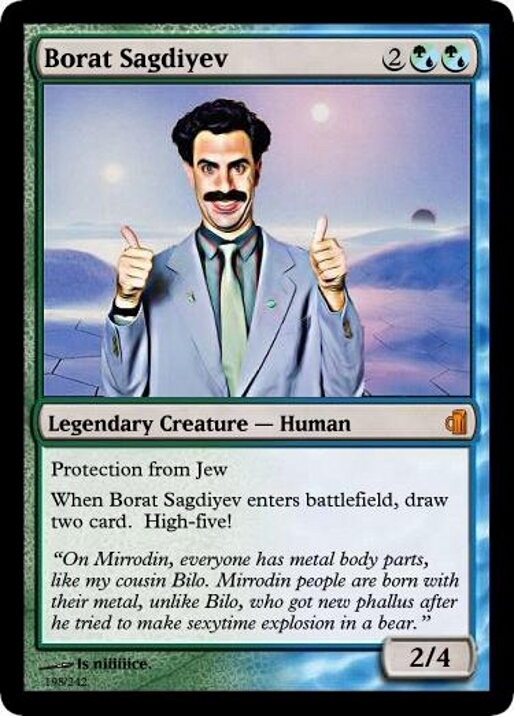 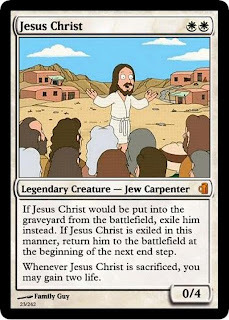 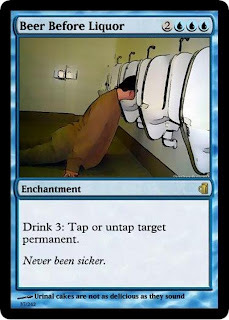 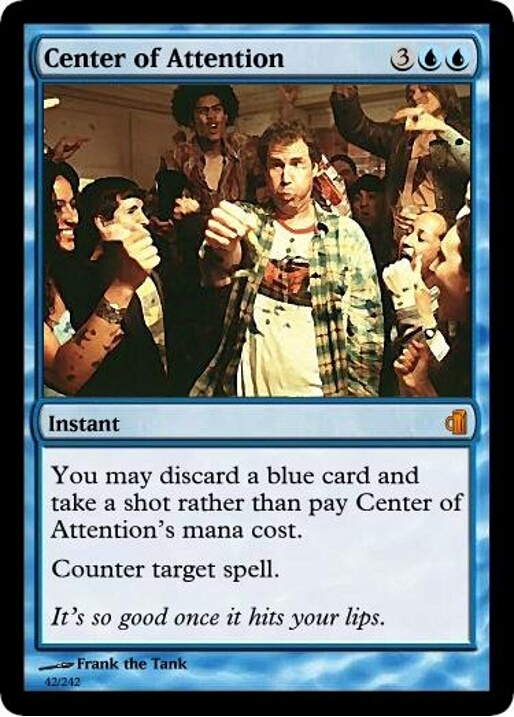 Then you can just have 'update' releases and posts with new card spoilers and such. 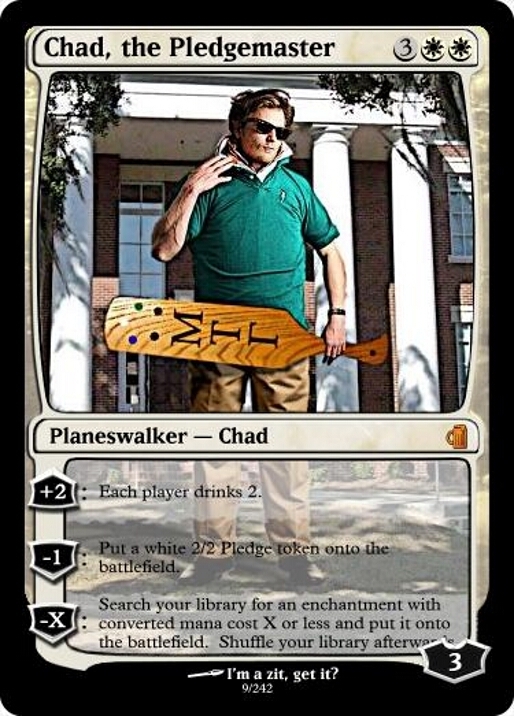 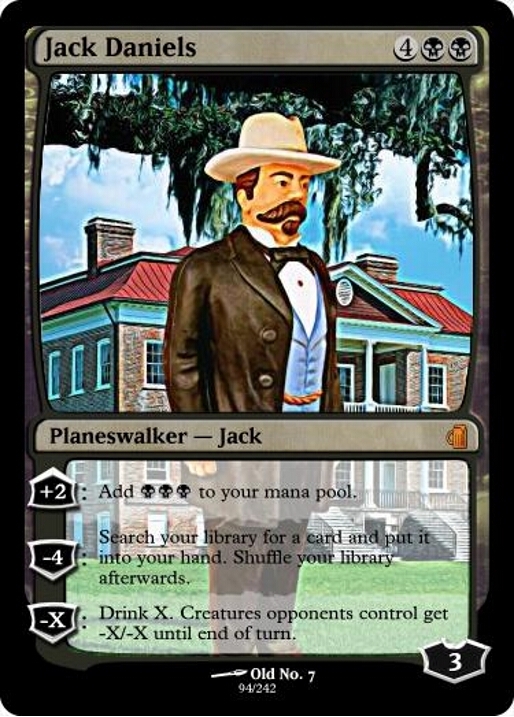 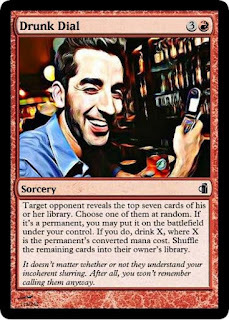 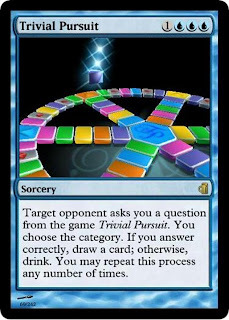 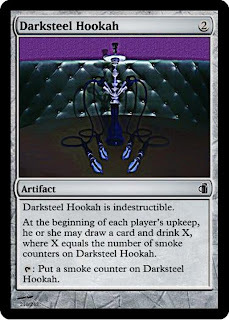 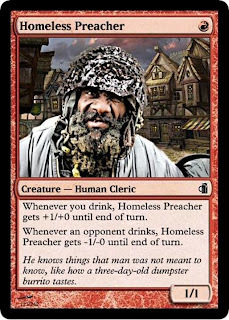 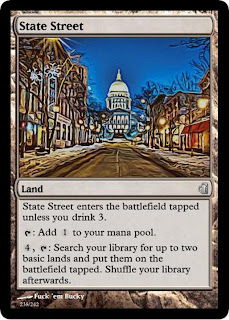 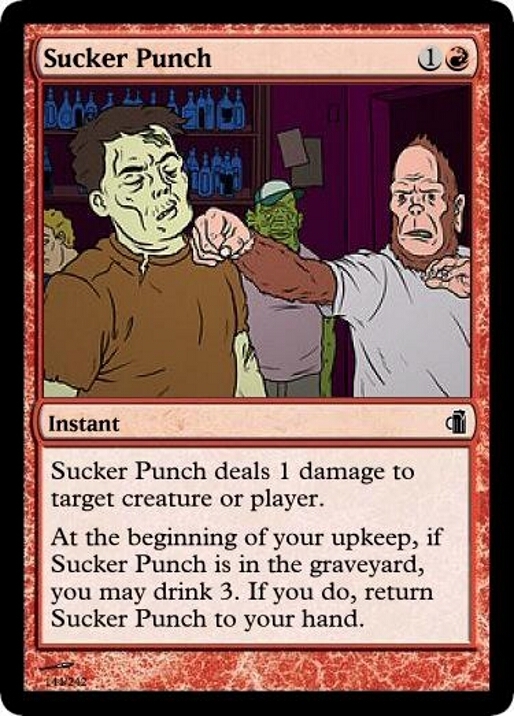 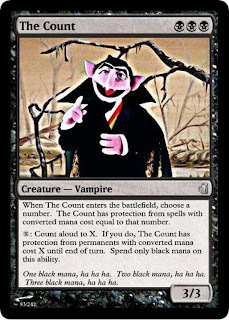 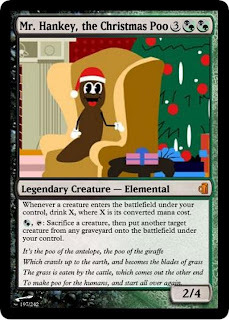 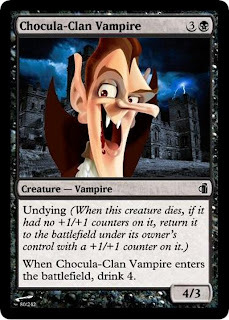 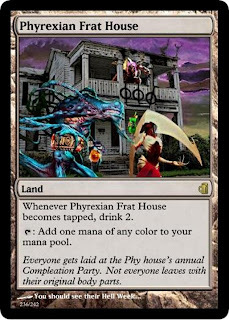 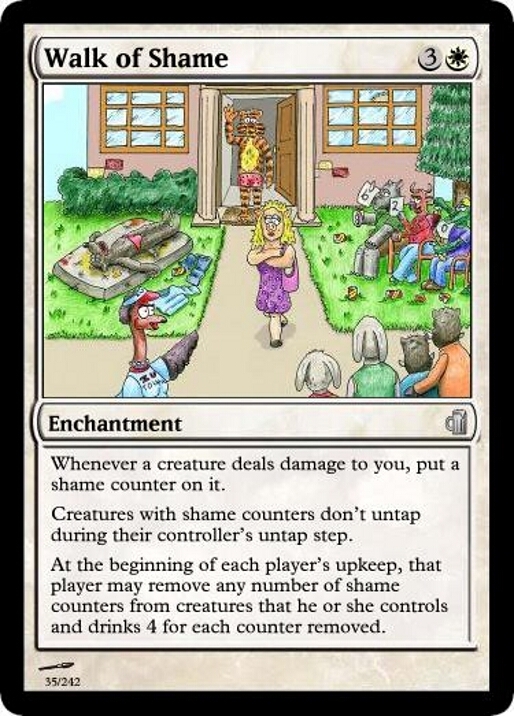 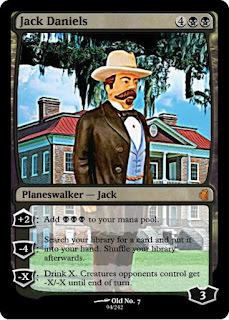 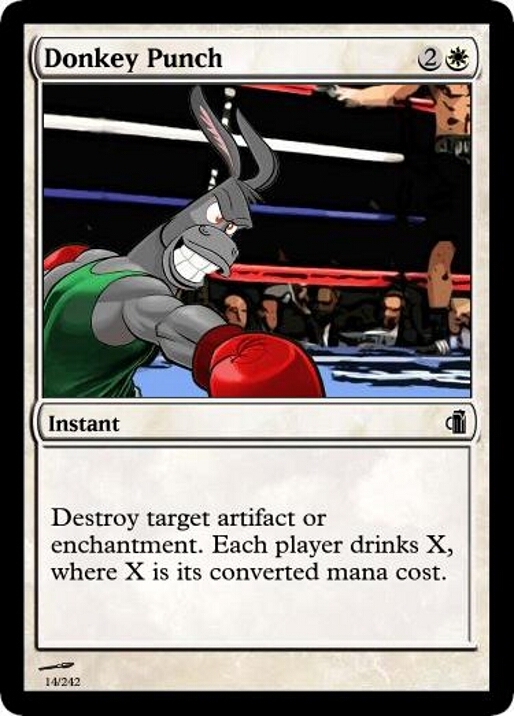 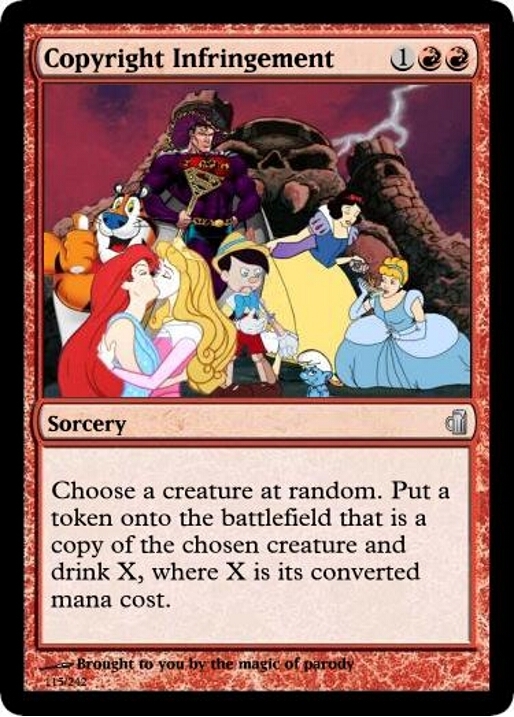 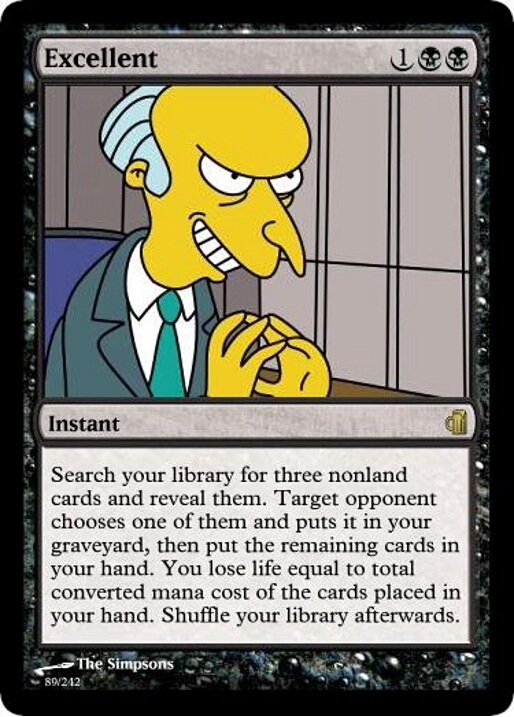 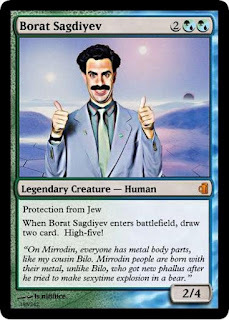 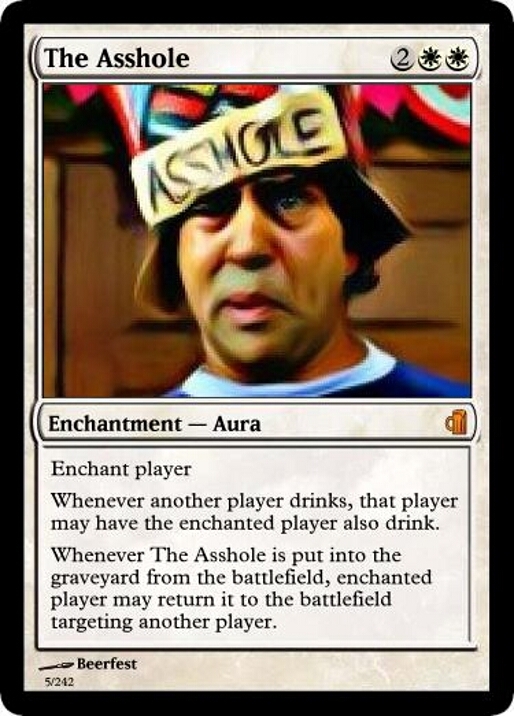 Update: The cards that were missing from the DPSs were: Jesus Christ, Trivial Pursuit, Excellent, Sparkling Vampire, The Count, Bar Fight, Stupid Spoiled Whore Video Playset, and Maze of Escher. 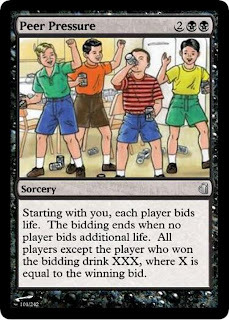 8 total. So it looks like it was just one sheet off. 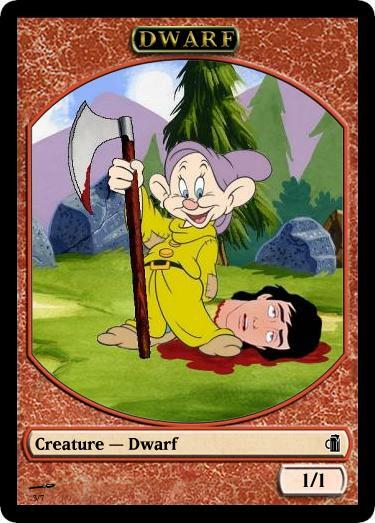 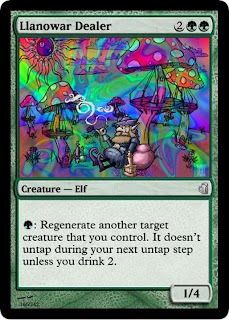 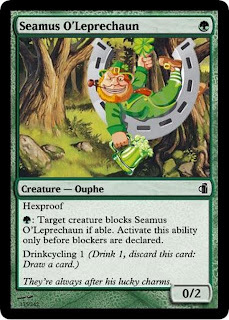 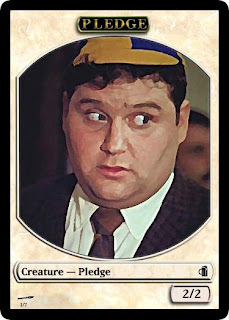 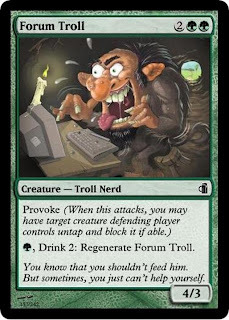 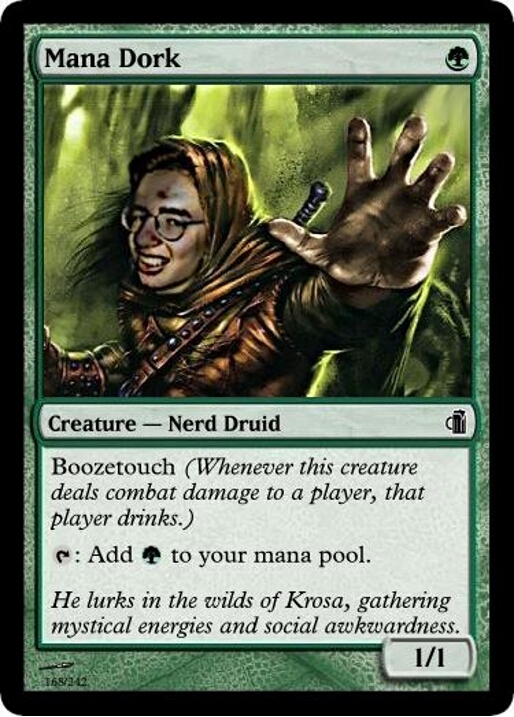 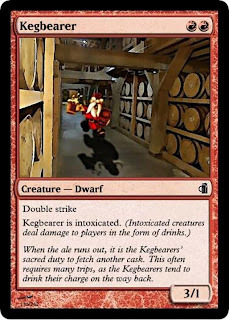 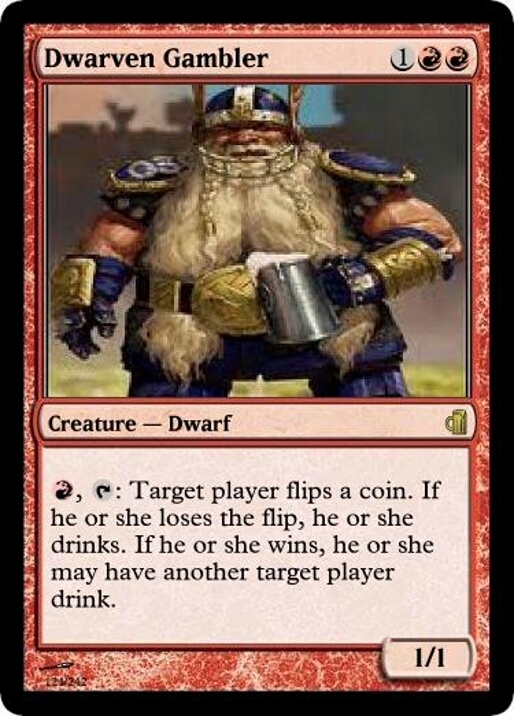 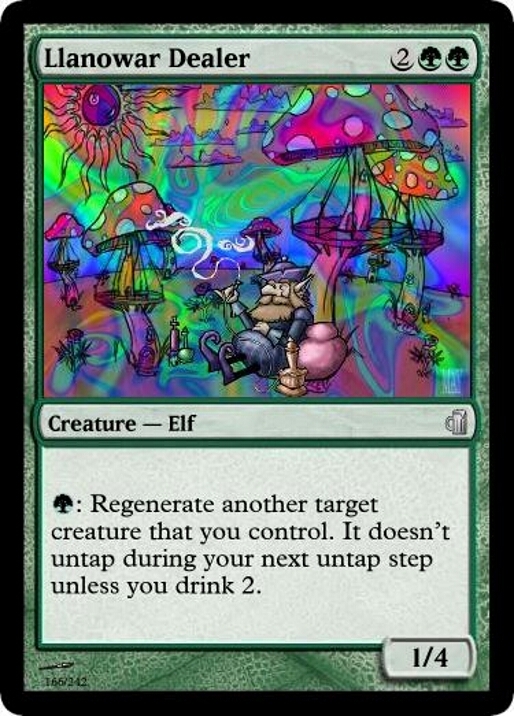 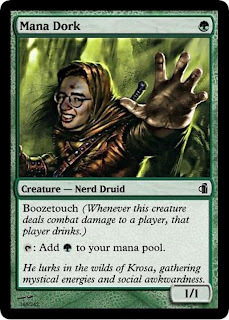 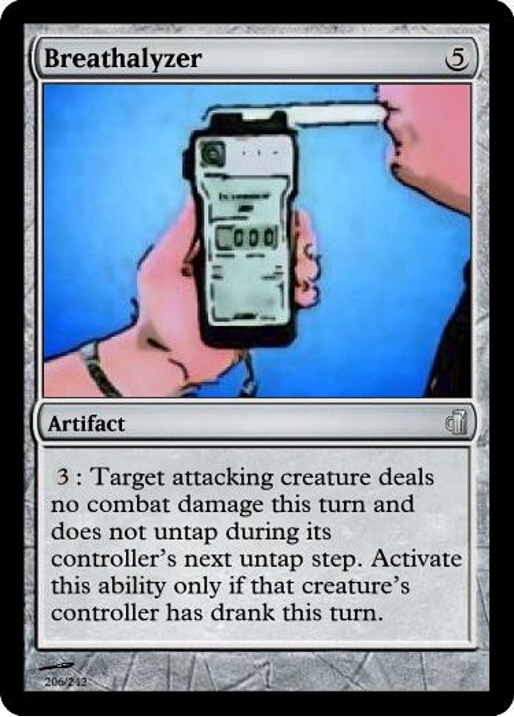 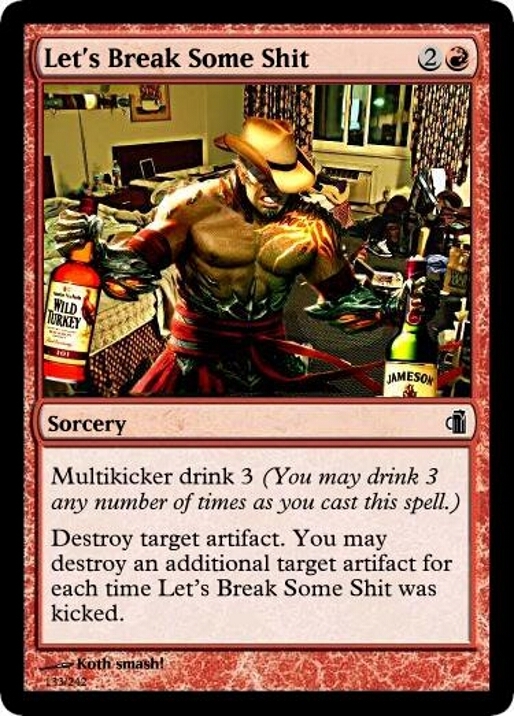 Seamus O'Leprechaun's activated ability says that "Target creature blocks Paddy O'Leprechaun"
Are you suppose to play as is or do you add this to a normal cube? 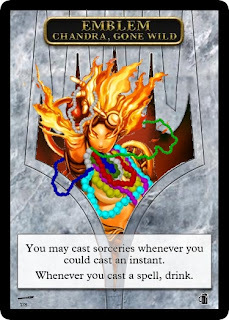 Just wondering if its possible for you to upload a print sheet with the emblem and token cards as I did not see them in the zip file. 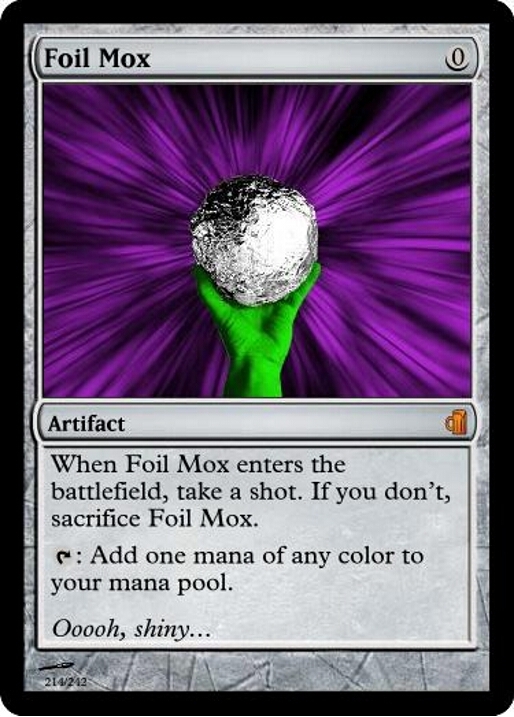 This cube is terrific and so much fun...I recently designed a personal expansion and can't wait to try it. Thanks so much.